Liquidity helps to ascertain an Exxon’s ability to pay operating expenses and other short-term, or current liabilities. In 2010 and 2011 it has a low liquidity measure and it indicate that the company might be having financial problems, or that the company is poorly managed. Hence, a fairly high liquidity ratio is good, however, it shouldn’t be too high, because excess funds incurred an opportunity cost and can probably be invested for a higher return. By looking at the graph, the current ratio of Exxon is less than 1, and their net working capital which used to run the business and to pays its current liabilities was not sufficient for the last two years. A negative working capital means that a company is unable to meet its short-term liabilities with its current assets. In other words, the net working capital of Exxon Mobil Corporation had an average of 18 percent. Financial liquidity shows the ability of the company to pay its short-term debt obligations. As we can see in the table above, the current ratio is the result of dividing current assets by current liabilities. It showed a downward trend from 2007 to 2011. The quick ratio is the result of dividing quick asset (current asset minus inventory) over current liabilities. The net working capital ratio is the result of working capital over current liabilities. The receivable turnover ratio is the number of times it was collected throughout the year. 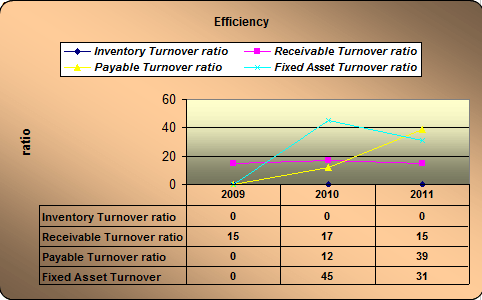 Inventory turnover ratio shows how many times a company’s inventory is sold and replaced over a period. This showed a growth ratio from 2007 to 2011 of 22 percent. The payable turnover ratio shows investors how many times per period the company pays its average payable amount. And fixed asset turnover ratio measures a company’s ability to generate net sales from fixed asset investments – specifically property, plant, and equipment – net of depreciation. Exxon Mobil Corporation showed a favorable average of 13 times a year wherein receivables are being collected. This indicates that they are efficient in their collections. And inventory takes an average of 20 times sold and replaced which was enough to replenish additional finished products. And their payable has an average of 10 times a year While fixed asset turnover showed that it falls down in 2009. So, they are not generating more revenues from their investments in fixed assets but in 2011, it slightly recovered to 2.27 which means a progressive improvement. Receivable conversion period measures the number of days it takes a company to collect its credit accounts from its customers. The days’ sales in inventory or inventory conversion period tell the business owner how many days, on average, it takes to sell inventory. Payable conversion period measures how the company pays its suppliers in relation to the sales volume being transacted. The average cash conversion cycle takes 19.4 days to convert their goods to cash. With their receivable conversion period of 29 days, inventory takes 18 days to sell and payable to suppliers takes 28 days to pay. So, this indicates that cash from receivables was converted fast, so cash can be used or financed again in their operations. Exxon Mobil Corporation has a debt ratio that depicts that they have more assets than debts. And if the ratio is greater than 0.5, most of the company’s assets are financed through debt. Thus, companies with high debt/asset ratios are said to be “highly leveraged,” not highly liquid and could be in danger if creditors start to demand repayment of debt. But with Exxon, they are within the limits of 50 percent. While they have a low debt-to-equity ratio indicating that the company was not taking advantage of the increased profits that financial leverage may bring. Debt ratio indicates what proportion of debt a company has relative to its assets. Wherein it has been stable at 50 percent from 2007 to 2008, increase to 53 percent in 2009 and 2011 with a slight decrease in 2010 to 52 percent. The debt-to-equity ratio is a measure of the relationship between the capital contributed by creditors and the capital contributed by shareholders. It also shows the extent to which shareholders’ equity can fulfill a company’s obligations to creditors in the event of liquidation. Solvency ratio determines how well Exxon is able to meet its debts as well as obligations, both long-term and short-term. It started as a very high solvent company with 553 and 611 percent, but it went down in 2009 and 2010 by 325 and 301 percent with the slight increase of 15.6 percent in 2011. Thus, a solvency ratio of greater than 20 percent is considered financially healthy. Current liabilities to total assets identify how much will be claimed by the creditor against total assets. While, long-term debt to total assets, on the other hand, is to make out how much claim has the banks or the bond holder against its total assets. Then, stockholders equity to total assets is to know how much the owner can claim in its total assets. Based in their total five years of operation the majority in control of their total asset are their stockholders at 48 percent followed by their creditors of 22 and last to their bank/bondholder at 3 percent average. Gross plant, property, and equipment are the gross total of fixed assets cost.This showed an upward trend yearly for the last five years. It had a growth ratio of -3.4 percent, 13, 22, and 5.4 with an average of 325,005 million dollars for five years. Accumulated depreciation is to reduce the carrying value of assets to reflect the loss of value due to wear, tear, and usage. Wherein it shows a yearly growth trend with an average of 165,896 million dollars which is 51 percent of the average cost of plant, property and equipment. The net plant, property, and equipment are the result after deducting the accumulated depreciation from gross PPE, this show an increase in 2008 then a decrease in 2009 but it increases back in 2010 and 2011. It has an average of 159,109 million dollars which is 49 percent of the average cost. Looking into its fixed assets, it has still useful life in their business operations. Therefore, based on the above data, the remaining book value of the PPE was 49 percent, using the percentage method of depreciation; this means it has 2.45 useful years remaining. By looking at the profitability, we can measure the success of a business in maintaining a satisfactory earning power and steadily increasing ownership equity. Their return on assets depicted unsatisfactory earnings for every dollar of total assets in 2009 due to their decrease in net income and succeeding years has a declining growth from 36 down to 14 in 2011. While their return on equity showed a favorable first two years but due to the financial crisis in the US, in 2009 returns declines down. But recovered in 2010 and 2011 with declining growth ratio of 37.2 and 15.2 percents. And financial leverage the portion of the equity which was the return on debts showed slight increases and a dip down in 2010. This means that the company was not taking advantage of the increased profits that financial leverage may bring. Likewise, the return on invested capital because of the crises, cash flow earned from invested capital dip down in 2009. Exxon Mobil Corporation revenues depicted the same trend wherein it all dipped down in 2009 meaning the US financial crisis had greatly affected company’s sales. But the good thing about it was they had recovered based on the succeeding year’s growth ratios on earnings. Their revenue means how much money a company has generated in terms of “sales”, representing the amount of money a company brings in for selling its goods and services. This showed an up and down trend with a growth ratio of 18 percent. Gross profit shows how much of their markup a company receive on the goods and services it sells after deducting its cost of revenue wherein it also depicts a decreasing trend. Likewise, the same trend with revenue with a growth ratio of 10 percent. Operating profit is the best indicator of a company’s true performance in their operations. For this is the result after deducting all the expenses incurred in their operations. This has a growth ratio of 16 percent. Net income is what’s left over for a company, after all, expenses have been accounted for. Exxon Mobil Corporation depicted good earnings with a growth ratio of 11 percent. The cost of revenue was the amount the company paid for the goods that were sold during the year. This showed an up and down trend and growth ratio of 24 percent, -26.7, 23.8, and 16.9 with trailing twelve months of $312,813 million. Operating expense was the expenses incurred in conducting their regular operations of the business. This depicted an up and down trend with a growth ratio of 5.5 percent, -40, 6.1, and 56.5. The other income was the non-operating income or expenses from their business. This reflected an increasing other income only in 2009 to 2011 with trailing twelve months of $2,758 million. Provision for income tax was the amount allocated for their payment of income taxes. This shows a growth ratio of 22.3 percent, -58.6, 42.6 and 44. 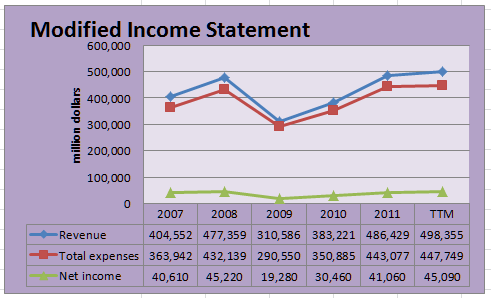 What is a modified income statement? It’s a graph that shows the relationship or the flow of revenue, expenses and net income. For Exxon Mobil Corporation, they depicted an abrupt dip down due to the US financial crisis in 2009. 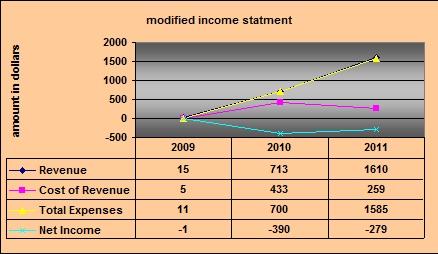 But revenue and total expenses in 2010 and 2011 had recovered and increased subsequently during the period. Exxon Mobil Corporation’s margin tells us the total performance of their business operations. Their gross margin indicates the percentage of revenue dollars available for expenses and profit after the cost of merchandise is deducted from revenues. And this averages 36.4 percent. And their operating margin is the operating income expressed as a percentage of sales or revenue after deducting the operating expenses from gross profit. The result showed an average of 14.8 percent. While the net margin is the net income expressed as a percentage of sales or revenue after deducting provision for income tax from income before tax. And it had an 8.2 percent average only. Exxon Mobil Corporation showed a profit margin of less than 50 percent, unfavorable declining operating margin with ratio below 17 percent and lastly, a net margin of less than 10 percent. This means that manufacturing operations, as what she told me, have margins below our scaling standards. On the other hand, but net income reflected a sufficient and impressive earnings. For for they had recovered from their declined income in 2009 which was due to financial crises in the US. Cash flow statement helps us determine if Exxon Mobil Corporation has an available cash for the operation or if they have a good free cash flow and excess of funds to refinance operations for business expansion. Cash flow from operating activities comes from their net income adding back depreciation and amortization, investment/asset impairment charges in 2009, deferred income taxes, inventory, prepaid expenses, other working capital and other noncash items to get the net cash provided by operations. This showed a growth ratio of 14.9 percent, -52.4, 70.2, and 14.3. They had a good cash flow from operations except for declined in 2009 net income due to the decrease in revenue. Cash flow from investing activities comes from their investments in plant, properties and equipment, acquisitions, purchases of investments, sales/maturities of investments and other investing activities to get the net cash used in investing activities. The company showed a growth ratio of 59.3 percent, 44.6, 7.9 and -8.4 with trailing twelve months of -15,415 million dollars. They were doing well in their investments for the first four years but in 2011, it slightly declined. Cash flow from financing activities comes from debt issued, debt repayment, common stock issued, repurchases of treasury stocks, cash dividend paid and other financing activities to get net cash provided by or used for financing activities. Wherein this depicted a growth ratio of 14.8 percent, -38, -1.3, and 4.9 with trailing twelve months of -29,725 million dollars. This means they had used cash flow in financing activities to the extent that it was declining down with the slight improvement in 2011. The cash flow of Exxon Mobile Corporation showed that it was affected by the exchange rate differences were favorable in 2007 and 2009 but in 2008, 2010 and 2011 it decrease down. This means that the company cash flow from operations in 2008 to 2010 was not enough after deducting the investing and financing activities. This may be due to the US financial crises. The cash at the end of each period after deducting the net change in cash from cash showed a decreasing trend as well. Reviewing their free cash flow, we deduct from operating cash flow amount their capital expenditures resulting to free cash flow to be used in operations and expansions. This shows that Exxon Mobil Corporation had sufficient free cash flow but indicating up and down trend yearly with the growth ratio of 10.4 percent, -85.2, 262.2, and 13.1 with trailing twelve months of $22,804 million. Operating cash flow to sales ratio measures how much cash generated from its revenue for the period. This showed a growth ratio of -6.9 percent, -26.4, 36.9, and -9.5. This means that not much earnings come from operations. Operating cash flow ratio measures how much cash left after considering short debt by using the result of operating cash flow from operating over current liabilities. This showed a growth ratio of 36.3 percent, -55.1, 41.6 and -7.6. Herein operating cash flow was sufficient only in 2009, the rest of the years it was not enough to pay for their current liabilities. Free cash ratio helps us conclude if the company will grow in the future. Through the result of operating cash flow, less dividend paid less capital expenditure over operating cash flow. This showed that free cash flow was sufficient to pay dividends and capital expenditures except in 2009, which reflected a -8.3 percent. Capital expenditure ratio measures company sustainability in maintaining their assets. By using the result of operating cash flow over capital expenditure for the period. Total debt ratio measures company efficiency, from the result of operating cash flow over total liabilities. The first five results showed an up and down trend with the growth ratio of 20.1 percent, -55.3, 34.1, and 0.64. The more capital a company has (the assets) compared to debt (the liabilities), the less leveraged or stronger equity position it is said to have. The more debt compared to assets a company has, the more highly it is leveraged. Herein the company reflected that it has a total liabilities than their operating cash flow, so they are highly leveraged. Current coverage ratio measures how much cash available after paying all its current debt. It can determine through cash flow from operating less dividend over current liabilities. This showed a growth ratio of 38.2 percent, -63.2, 63.6 and -6.2, with trending a dip down twice in 2009 and 2011. However, only in 2008, it has a favorable coverage ratio that is more than 1:1 or a 100 percent greater showing that the company can repay all debt within one year. With regards to the current coverage, in broad terms, the higher the coverage ratio, the better the ability of the enterprise to fulfill its obligations to its lenders. This means the company’s current liabilities were more than the operating cash flow after paying off dividends. Therefore, cash flow from operation was not sufficient for their current obligations. Why you Should Add USANA Health Sciences Inc (USNA) to your List? USANA Health Sciences Inc (USNA) has been recognized as one of the Top 15 revenue growth companies for eight consecutive years. USNA marked the number nine spot on the prestigious list. And according to Dough Hekking, the CFO himself, they plan to continue the consistent growth into 2013 and beyond. The market value for USANA Health Sciences Inc was trending at -7, -8, 36, -30 and 56 percent with an average of 100 percent. Its total debt was 2 percent, while its cash and cash equivalent were 5 percent average, thus making the enterprise value lower by 3 percent from the market value. The trend was erratic for the market price with an up and down movement. Buying the entire business of USNA would be paying 100 percent of its equity because its cash and cash equivalent are higher than the total debt. The purchase price for USNA to date, October 19, 2012, was $629.4 at $41.96 per share. To date’s market price was $48.08 per share. 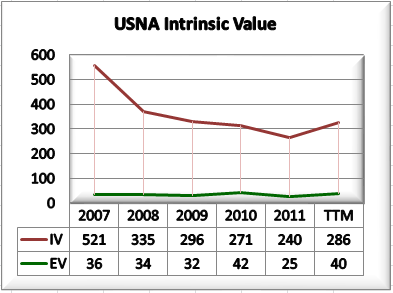 The table for NCAVPS indicates that the stocks of USANA Health Sciences Inc traded at an overvalued price from 2007 to ttm8 because the market price was greater than the 66 percent of NCAVPS. In other words, the price was above the liquidation value of USNA. The 66 percent represents only $1 average, while the market price was $37 average, this shows that the liquidation value of USNA represents only 3 percent of the market price. Furthermore, it tells us that the stock of USNA did not pass the stock test of Benjamin Graham. The MV/NCAV evaluation indicates that the stock of USNA was trading at the overvalued price during 2007 to 2010 because the ratios were more than 1.2, while during 2011 and ttm8, the price was undervalued because the ratio did not exceed 1.2. It tells us that the stock of USANA Health Sciences Inc did not pass the stock test of Benjamin Graham because the price was expensive in 2007 to 2010, while the current period of 2011 and ttm8, shows that the stock passed the stock test of Benjamin Graham because the price was cheap. The Margin of Safety requires knowing when the buying price is low in absolute terms, rather than merely relative to the market as a whole. This formula is used to identify the difference between company value and price. Value investing is based on the assumption that two values are attached to all companies – the market price and the company’s business value or true value. Graham called the latter as the intrinsic value. The difference between the two values is called the margin of safety. Graham considers buying when the market price is considerably lower than the intrinsic or real value, a minimum of 40 to 50 percent below. In my calculation, I used enterprise value because it takes into account the balance sheet so it is a much more accurate measure of the company’s true market value than market capitalization. 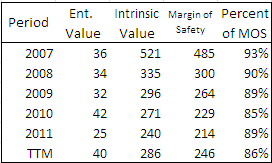 Let us find out through the margin of the safety table below for USNA. It indicates that there was a margin of safety for USANA from 2007 to ttm8 with an average of 89 percent. the highest margin of safety was in 2007 at 93 percent. Moreover, the intrinsic value was deteriorating in value at a rate of -10 percent on average. USANA can be considered a good candidate for buying with a margin of safety more than the required 40-50 percent above the enterprise value. EPS, the company’s last 12-month earnings per share; G: the company’s long- term (five years) sustainable growth estimate; 9 : the constant represents the appropriate P-E ratio for a no-growth company as proposed by Graham (Graham proposed an 8.5, but we changed it to 9); and 2: the average yield of high-grade corporate bonds. 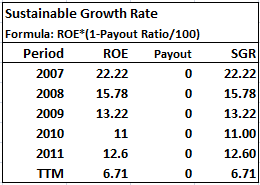 The intrinsic value factors the earning per share and sustainable growth rate. The EPS was increasing, a favorable sign, while the sustainable growth rate for USNA was deteriorating, so as with the annual growth rate, which affected also the intrinsic value. 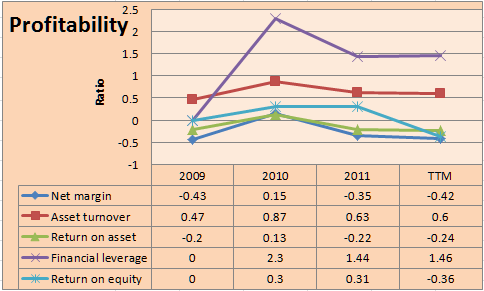 It tells us that the return on equity was decreasing from 2007 up to ttm8. 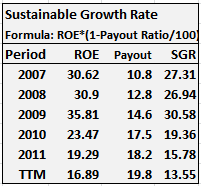 The sustainable growth rate was the same as the return on equity because there was no payout ratio. USNA was not paying cash dividends to its shareholders from 2007 to ttm8. The average ROE was $57.8 from its 5 years of operation. As we can see, using the average return on equity produces higher results. The margin of safety was 90 percent against 89 percent in relative ratio, thus making it favorable for USNA. True value (red line) was high above the enterprise value (price), the space in between these two lines was the margin of safety. Giving it a percentage, it represents 89 percent average, and that is your margin of safety in buying the stocks of USANA Health Sciences Inc, while the enterprise value was constant at $12 average. In P/E*EPS the stocks of USNA were trading at an undervalued price because the enterprise value was lesser than the P/E*EPS results. The P/E*EPS represent $38 average while the enterprise value was $35 average. This is the separation of price and earnings. In other words, P/E*EPS was 8 percent over price. USNA stock was trading at an undervalued price because the enterprise value was lesser than the P/E*EPS results. The P/E*EPS represent $38 average while the enterprise value was $35 average. This is the separation of price and earnings. In other words, P/E*EPS was 8 percent over price. Since the stock price was trading at an undervalued price; it means that the price was cheap from 2007 to ttm8. Moreover, I made two calculations in the P/E*EPS valuation, and that is by using the relative and average approach. Using the average price to earnings ratio produce a higher price to earnings and P/E*EPS. In EV/EPS price (P/E) represented 38 percent and the earnings (EPS) was 62 percent thus the price is undervalued. This is the price that an investor is willing to pay. This metric is useful for analyzing and comparing profitability between companies and industries. It will take 8 years or 8 times the earnings to cover the cost of buying the entire business. EBITDA was only 13 percent of the enterprise value. The net earnings were 9 percent of the total revenue, while its EBITDA was 15 percent of the total revenue. The enterprise value was 3 percent lower than the market capitalization. The market value was erratic in movement by 100 percent average. Benjamin Graham’s net current asset value approach indicates that the stock of USNA was overvalued from 2007 to ttm8. In other words, the stock was trading above the liquidation value of USNA. While MV/NCAV tells us that the price was overvalued because the result exceeds 1.2. Moreover, the margin of safety indicates an average of 89 percent using the relative ratio. While using the average ROE, the margin of safety was 90 percent. The intrinsic value was deteriorating at a rate of 10 percent average. Furthermore, the sustainable growth rate for USANA was $58 average, while the annual growth rate was $125 average. The return on equity was $58 average, 62 percent using the average ratio. On the other hand, the relative valuation method price was undervalued. The P/E*EPS percentage was 109 percent. While the EV/EPS showed that the price (P/E) was 38 percent average and the earnings (EPS) was 62 percent. This is the separation of price and earnings from the enterprise value. The EV/EBITDA tells us that buying USANA it will take 8 years or 8 times of the cash earnings to cover the cost of buying. Overall, the margin of safety was 90 percent and the price was undervalued. I, therefore, recommend a BUY in the stock of USANA Health Sciences Inc.
Is Technical Communications Corporation (TCCO) Consistently Positive? Technical Communications Corporation (TCCO) manufactures communication security devices that allow users to scramble transmitted information to ensure privacy. Its products are used to protect communication over radios, telephones, fiber optic cables, and satellite links. In value investing, it is important to be knowledgeable in the financial aspects of the firm we are planning to invest in. When we talk of financials, we refer to balance sheet, income statement and cash flow statement of the company. The company’s current ratio was 5, 6, 3, 5 and 14. Average of 6.5, which means that its current asset was 650 percent of its current liabilities. It shows that the company possessed vast current resources consecutively for five years of operation. While quick ratio was 3, 4, 2, 4 and 11, with an average of 5, which means that current resources(net of inventory) were 500 percent of its short term obligations. And networking capital ratio was .80, .71, .67, .73 and .87. Average of .76, which means that the average net working capital left was 76 percent after paying off its current obligations. Based on the above table, the company is financially stable as far as its current resources were concerned. Working capital was consistently positive and continued to increase year over year. Its current ratio had an average of more than 500 percent as well as its quick ratio. After the settlement of its current obligations, the company ’s working capital left was 76 percent. Asset management ratios are the key to analyzing how effectively and efficiency your small business is managing its assets to produce sales. Asset management ratios are also called turnover ratios or efficiency ratios. I asked Rio how exactly this efficiency thing goes for TCCO and gladly she gave me first-hand results, come on let see. 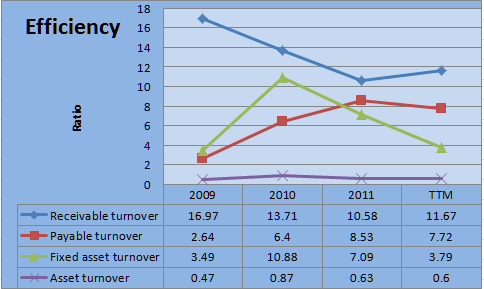 Inventory turnover ratio was 1, 2, 1, 1 and 1, which shows that high turnover was in 2008 of two times while the rests were 1. Receivable turnover ratio was 12, 0, 0, 7 and 0. As noticed, the company was not selling on credit, since its receivable transactions were recorded in 2007 and 2010 only. Considering the company’s industry is in technology, its inventory was composed of communication equipment which is sellable to the same line of business only. The company recorded minimal receivable in 2008 and 2011 with no payable. Most probably, the company sells its products on cash with order basis. Debt ratio was .07, .2, .33, .14 and .20, with an average of .19 which means that in five years’ time its total obligation was 19 percent against total assets of the company. The company is operating its business mostly on a cash basis with the minimal loan. Debt to equity ratio was .08, .25, .43, .17 and .25, with an average of .24. This tells us that its debt was only 24 percent of stockholder’s equity. And solvency ratio was 2, 2.7, .33, 1 and 1. Average of 1.4. This tells us that TCCO is 140 percent solvent. Current liabilities to total asset was .07, .20, .33, .14 and .20. Average of .19. This tells us that the creditors, most probably suppliers have only 19 percent claims on the total assets of the company. Owners’ equity to total asset was .87, .80, .78, .86 and .80. Average of .82. This means that the stockholders or owners had the majority control of the total assets of the company at a percentage of 82. Referring to the above data, the company continued to be financially sound with minimal obligation and high solvency ratio, thus, giving us the idea that the company is well managed. TCCO’s investment in property, plant, and equipment has an average of 3 in five years’ period. As noticed, the company is conservative in acquiring real properties. After deducting its accumulated depreciation, it resulted in a zero net book value of the PPE. Net margin of the company has an average of 20 percent and is quite good. This is simply the after-tax profit a company generated for each dollar of revenue. The rule of thumb is higher net profit is preferable. Asset turnover ratio was 1, 1, .89, 1.47 and .80, with an average of 1.03. It means that TCCO generates $1.03 average of sales for every $1 of assets. As noticed, the asset turnover ratio tends to be inversely related to net profit margin or the higher the net profit margin, the lower the asset turnover. Return on asset of TCCO was .20, .14, .11, .53 and .13 with an average of .22. This means that the company generated a profit of $0.22 for each $1 in the asset. Return on equity was .25, .17, .14, .67 and .15. Average of .28. , which shows the firm’s earnings on the funds invested by the shareholders. 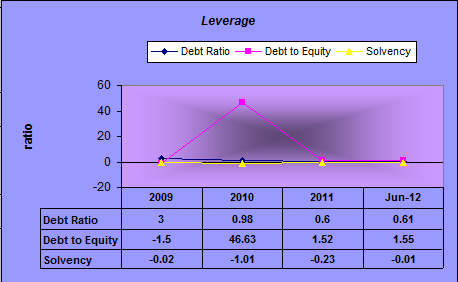 Financial leverage or equity multiplier was 1.25, 1.17, 1.29, 1.25 and 1.15 with an average of 1.22. This is derived by dividing total asset by total stockholders’ equity. It allows the investor to see what portion of the ROE is the result of debt. Return on invested capital was .28 average which quantifies how well a company generates cash flow relative to the capital it has invested in its business. The company’s net margin was good at an average of 20 percent. Its operating asset was efficiently used as the firm generated $1.03 average of sales for every dollar of asset and a profit of $0.22. Return on equity was 28 percent average which means that the company earned $0.28 for every $1 of equity investment. And finally, the company’s return on invested capital has an average of 28 percent which shows its efficiency in generating cash flow relative to invested capital. Revenue was 5, 7, 8, 22 and 12, with ttm of 9. The firm’s revenue was yearly increasing from 2008 to 2010 by 40, 14, and 175 percent but dropped in 2011 by 45 percent. Gross profit was 3, 4, 5, 16 and 10, ttm of 7. This is the result after deducting the cost of revenue from revenue. Operating income/income before tax was 1, 1, 0, 11 and 3. The difference of gross profit and the operating expense. 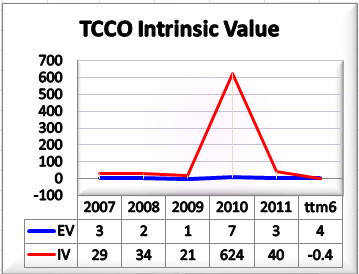 TCCO’s operating income in 2008 was the same with 2007, breakeven in 2009, high in 2010 at $11 but dropped to $3 in 2011. And finally, income after tax was 1, 1, 1, 8 and 2, the company has the same after-tax income in 2007 to 2009, it rose up in 2010 but went down in 2011. TCCO’s past five years performance was impressive in the sense that its revenue showed a positive result, although not that high it was performing well in 2007 to 2010. However, it dropped in 2011 by 45 percent. After deducting the cost of revenue, operating expenses and provision for income tax, the company managed to maintain a positive income of $1 in the first 3 years, increased to $8 in 2010 but dropped in 2011 to $2. The same trend goes with its revenue. The cost of revenue was 2, 3, 3, 5 and 2, with ttm of 2. This represents 40, 43, 38, 23 and 17 percent of revenue. Selling, the general and administrative expense was 2, 2, 3, 3 and 3, with ttm of 3. This is also 40, 29, 38, 14 and 25 percent of revenue. Its high expense was in 2007 and 2009 in percentage. Income tax was 3 and 1 in 2010 and 2011 respectively, which is 14 and 8 percent of revenue. Considering the industry of Technical Communications Corporation, its cost of revenue was not so high and almost the same percentage with its operating expense. Gross margin was .60, .57, .63, .73 and .83. Average of .67. The result fluctuated per year, wherein its highest was in 2011 at 83 percent. Operating income and pretax margin was .20, .14, 0, 50 and 25. Average of .22. It was break-even in 2009, high in 2010 at 50 percent, however, dropped by 25 percent in 2011. Net margin was .20, .14, .13, .36 and .17. Average of .20. The company incurred low net margin in 2009 but high in 2010 at 36 percent, resulted in an average of 20 percent in 5 years period. TCCO’s gross margin was high at above 50 percent throughout five years of operation with an average of 67 percent. After considering all the related operational costs plus provision for income tax, the company’s net margin was 20 percent average. This is quite good, the company is managed well. As per the above table, the company’s revenue incurred an up and down trend with high sales in 2010, but the rests were of the same level. After deducting the cost of revenue and operational costs, it resulted in a positive net income which its highest peak was in 2010. Cash flow statement is the third statement of the financial statements which shows the cash outflows and inflows of the company. Net income was 1, 1, 1, 8 and 2, which is the result of the normal day to day operation of the business. It shows that its peak was in 2010. Accounts receivable was -1 in 2011. Inventory was also -1 in 2011. 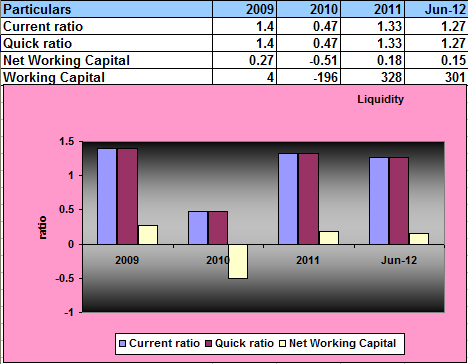 While other working capital was 1, 1 and -2 from 2009 to 2011 respectively. So, its net cash provided by operating activities was 1, 1, 2, 9 and -1, wherein 2009 was high so far but dropped to -1 in 2011. As shown in the above table, operating cash flow was good in the first four years. Its highest peak was in 2010, additions made was in other working capital while deductions were adjustments on receivables and inventory which resulted in a negative balance of 1 in 2011. There was no related transaction to investing activities for the past five years in this company. Financing cash flows refer to cash received by Technical Communications Corporation from the issue of debt and equity or paid out as dividends, share repurchases or debt repayments. 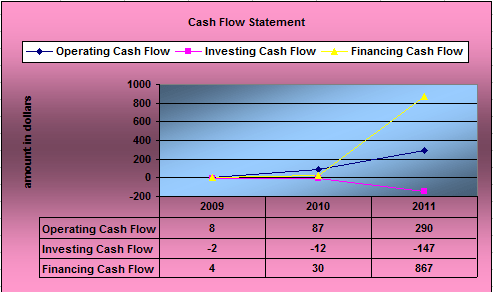 Cash inflow was 1 due to common stock issued in 2010. Cash outflow was -5 due to the dividend paid in 2010 of -4 and 2011 of -1. 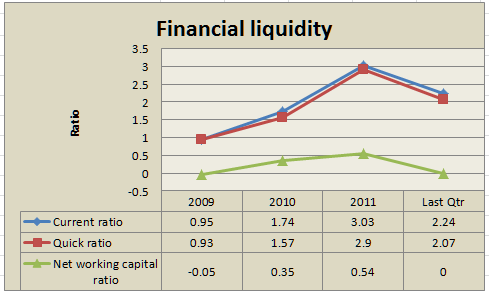 Net cash provided by financing activities was -3 and -1 in 2010 and 2011 respectively. It has a negative result because cash out was greater than cash inflows. Transactions involved under this category, financing cash flow were limited to issuance of common stock and payment of dividends to shareholders in 2010 and 2011 only. Free cash flow was the net amount after deducting capital expenditure from operating cash flow. For the past five years, the company did not invest in a fixed asset; therefore, its free cash flow was the same with its operating cash flow of 1, 1, 2, 9 and -1 from 2007 to 2011 respectively. Cash flow ratios measure a company’s ability to meet ongoing financial and operational commitments. To determine how efficient the cash flow of the firm used in the business operation, we need to used different ratios. Operating CF to sales was .20, .14, .25, .41 and -.08. Average of .18, which means that the company generates an average of $0.18 of cash flow for every $1 dollar of sales. Operating cash flow ratio and current coverage ratio was 1,1,67, 3 and -1. Average of .93. It is the result of dividing cash flow from operation by total current liabilities. This tells us how much cash flow can cover the short term obligation of the company. Free cash flow ratio was 1, 1,1,1, and 1. Average of 1 which shows that the company has available funds to retire additional debt, additional dividends and invest another line of business. Capital expenditure ratio was 0 because the company has no investment in real property during its five years of operation. Total debt ratio was 1, 1, .67, 3 and -1. Average of .93 which means that TCCO has 93 percent ability to carry its total debt. This ratio provides an indication of a company’s ability to cover total debt with its yearly cash flow from operations. The higher the percentage ratio, the better the company’s ability to carry its total debt. As shown above, the company is doing good in its operation, cash flow ratios show that TCCO has available funds to expand its business through the investment of other lines. In the same manner, it has also the ability to cover not only short term debt but long term debt as well. Systemax Inc (SYX) Value Falling Down? Systemax Inc. (SYX) is a leading retailer of brand name and private label products, including industrial, and material handling supplies. This Pricing Model was prepared in a very simple and easy way to value a company for business valuation. Furthermore, she added that his model adopts the investment style of Benjamin Graham, the father of Value Investing. The essence of Graham’s Value Investing is that any investment should be worth substantially more than an investor has to pay for it. He believes in thorough analysis, which we call fundamental analysis. He looks for companies with strong balance sheet or those with little debt, above average profit margin and ample cash flow. His Philosophy was to buy wisely when prices fall and to sell wisely when the price rises a great deal. My basis in valuation is the company’s five-year historical financial records, the balance sheet, income statement, and cash flow statement. In this model, we calculate first the enterprise value as our first step in valuation. I consider this important because this is a great measure for the total value of a firm and is often a great starting point for negotiation for a business. Enterprise Value (EV) is the present value of the entire company. EV takes into account the balance sheet, so it is a much more accurate measure of a company’s true market value than market capitalization. It measures the value of the productive assets that produced its product or services, both equity capital (market capitalization) and debt capital. Market capitalization is the total value of the company’s equity shares. EV is a capital structure neutral metric. This makes enterprise value extremely useful in analyzing and comparing companies with different capital structure. In essence, it is a company’s theoretical takeover price, because the buyer would have to buy all of the stock and pay off existing debt while pocketing any remaining cash. The market value of Systemax, Inc. fell down at a rate of -5 percent average, alongside the enterprise value at a rate of -2 percent average. Total debt represented 2 percent of the enterprise value while, cash and cash equivalent represented 24 percent of the enterprise value, thus enterprise value was lower by 22 percent than the market value. The market capitalization to date, October 10, 2012, was $449 at $12.13 per share. Buying the entire business to date will cost $297.3 at $8 per share, this is the buying price, and it represents 100 percent equity. Graham developed and tested the net current asset value (NCAV) approach between 1930 and 1932. According to his report, the average return, over a 30-year period, on diversified portfolios of net current asset stocks was about 20 percent. An outside study showed that from 1970 to 1983, an investor could have earned an average return of 29.4 percent by purchasing stocks that fulfilled Graham’s requirement and holding them for one year. I dig up some research and studies have all shown that the net current asset value (NCAV) method of selecting stocks has outperformed the market significantly. Graham was looking for firms trading so cheap that there was little danger of falling further, which I find realistic and practical. His strategy was indeed risky at first but it calls for selling when a firm’s share price trades up to its net current asset value. The reason for this according to Graham is when a stock is trading below the net current asset value per share, they are essentially trading below the company’s liquidation value and therefore, the stocks are trading in the bargain, and it is worth buying. The result for the net current asset value method for SYX was that the price was trading at an overvalued price from 2007 to 2012 because the enterprise value was greater than 66 percent of NCAVPS. This means that the stocks did not pass the stock test of Benjamin Graham. The two-thirds was 43 percent of the enterprise value, therefore the price was overvalued. Another stock test by Graham is by using market capitalization and dividing it to net current asset value (NCAV). If the result does not exceed the ratio of 1.2, then the stock passes the test for buying. So, let us see if the stock of SYX passes the stock test. Using the market value/net current asset value valuation, it indicates that the stock of Systemax Inc. was trading at an overvalued price from 2007 to 2011 because the ratio exceeded 1.2. The MV/NCAV valuation tells us that the stocks of SYX did not pass the stock test of Benjamin Graham in 2007 to 2011, however, in ttm8, the stock passed the test. You should be aware that Margin of Safety requires knowing when the buying price of the stocks is low in absolute terms, rather than merely relative to the market as a whole. This formula is used to identify the difference between company value and price. Value investing is based on the assumption that two values are attached to all companies, the market price and the company’s business value or true value. Graham called it the “intrinsic value” at the same time, buying with the difference between the two values is called the margin of safety. Value buying with a sufficient margin of safety is needed for a stock to be considered a true value investor. Graham considers buying when the market price is considerably lower than the intrinsic or real value, a minimum of 40 to 50 percent below. I used enterprise value because it takes into account the balance sheet so it is a much more accurate measure of the company’s true market value than market capitalization. 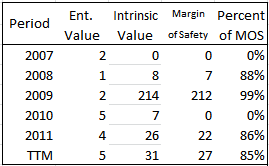 Let us find out and walk through the margin of safety table below for Systemax Inc.
After looking into the table above, I came to the realization that the intrinsic value of SYX was greater than the enterprise value, therefore, there was the margin of safety from 2007 to ttm6 2012 at an average of 73 percent. The highest margin of safety was in 2008 at 90 percent, while its lowest was in ttm6 at 57 percent. As far as I can remember, Benjamin Graham would consider buying if the price was lower the intrinsic value by 40-50 percent. The intrinsic value of SYX was erratic in movement but generally, it was deteriorating. 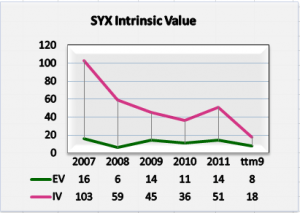 The intrinsic value is the true value of the stock of SYX. EPS: the company’s last 12-month earnings per share, G: the company’s long term (five years) sustainable growth estimate, 9: the constant represents the appropriate price to earnings ratio for a no-growth company as proposed by Benjamin Graham (Graham proposed 8.5, instead, we used 9), 2: the average yield of high-grade corporate bonds. The intrinsic value was dropping at a rate of -22 percent from $103 down to $18.38. The sustainable growth rate was 26 percent average, while the annual growth rate for SYX was represented at a 70 percent average of the intrinsic value. The sustainable growth rate was generally decreasing. There was no payout ratio because SYX was not paying dividends to its shareholders. 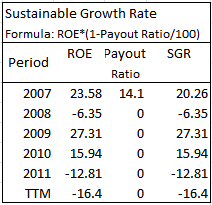 Thus, the return on equity was the same as the sustainable growth rate. The true value of the stocks deteriorates from $103 to $18 in its 5 years of operation. However, the enterprise value deteriorates at 50 percent. The space between the EV line and IV line represents the margin of safety. 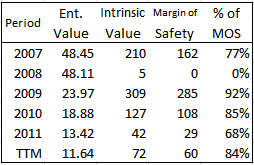 The intrinsic value was higher than the enterprise value, meaning there was a margin of safety. The margin of safety for SYX was 73 percent average. The methods used in calculating the growth of SYX is by using the relative and the average return on equity. The table below will show us the result of the two approaches. Using the average approach produces a higher result of growth, intrinsic value and margin of safety. Using the average, we consider the previous performance of the company. The relative valuation methods for valuing a stock are comparing market values of the stock with the fundamentals (earnings, book value, growth multiples, cash flow, and other metrics) of the stock. This valuation will determine whether the stocks are undervalued or overvalued. By multiplying the Price to Earnings (P/E) ratio with the company’s relative Earning per Share (EPS). Then comparing it to the enterprise value per share, we can determine the status of the stock price. 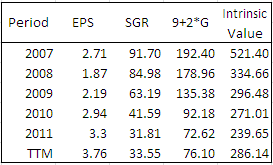 The P/E*EPS the stocks of SYX were trading undervalued because the enterprise value was lesser than the P/E*EPS ratio. The P/E*EPS was represented at 129 percent over enterprise value, in other words, the price was cheap. The average price to earnings ratio produces a higher P/E*EPS, meaning, the price was undervalued. The use of this ratio is to separate price and earnings in the enterprise value. The price (P/E) was 76 percent, while the earnings (EPS) was 24 percent average. EV/EBITDA valuation means that you will have to wait five years to cover the cost of buying. It is a long period of waiting since it will take 5 times the earnings to cover the purchase price. Total debt was 2 percent average, while cash and cash equivalent was 24 percent average. Buying the entire business to date, October 10, 2012, the costs will be $297 at $8 per share. The market capitalization to date was $449 at $12.13 per share. Using the net current asset value approach, stocks were trading overvalued. Because 66 percent of NVAV was lesser than the enterprise value. In other words, the price was above the liquidation value of SYX. In addition, the price was overvalued because the result was more than a 1.2 ratio. Therefore, the NCAV approach did not pass the Benjamin Graham’s stock test. On the other hand, the margin of safety was 73 percent using relative ROE; 76 percent using the average ROE. The sustainable growth rate was 26 percent. The price was undervalued in the P/E*EPS, while in EV/EPS price (P/E) was 76 percent. In addition, the earnings (EPS) was 24 percent. The price was overvalued. Moreover, the EV/EBITDA tells us that it will take 5 years of the earnings to cover the costs of buying. Overview, although there was a margin of safety, the stock of SYX was trading at an overvalued price. Therefore, I recommend that the stock of Systemax Inc be HOLD. TCCO was founded in 1961 and headquartered in Concord, MA. Registered under NASDAQ. The market value of Technical Communications Corporation was erratic in its movement at -19, -12, 235, -44 and -23 percent from 2007 to ttm6 2012, with an average of 23 percent. While the enterprise value, on the other hand, was at -40, -67, 1300, -64 and 40 percent with an average of 195 percent. Total debt was zero, thus, resulting in a no-debt-equity ratio of zero. Its cash and cash equivalent were 51 percent of the market value or 103 percent of the enterprise value. Buying the entire business of TCCO will be equivalent to 100 percent equity. The current market capitalization to date, October 16, 2012, was $10.5 million at $5.85 per share. Buying to date will cost $6.5 million at $3.25 per share, this factors cash and cash equivalent. The net current asset value approach for TCCO tells us that, the stock traded at an overvalued price from 2007 to ttm6 2012, because the result of 66 percent of NCAVPS was below the market value. Therefore the stocks did not pass the stock test of Benjamin Graham. In other words, the stock was trading above the liquidation value of TCCO, meaning, the price was expensive. Another net current asset value approach was the MV/NCAV valuation. It shows that during 2007, 2008 and 2010, the price was overvalued because the ratio exceeds 1.2. On the other hand, during 2009, 2011 and ttm6, the price was undervalued because the ratio did not exceed 1.2. It tells us that in the current year, 2011 and ttm6, the stocks of TCCO was trading at an undervalued price, thus indicating that the price was cheap. The margin of safety is used to identify the difference between company value and price. Value investing is based on the assumption that two values are attached to all companies – the market price and the company’s business value or true value. Graham called it the intrinsic value. The difference between the two values is called the margin of safety. According to Graham, the investor should invest only if the market price is trading at a discount to its intrinsic value. Value investing is buying with a sufficient margin of safety. The question is, “How large of a margin of safety is needed for a stock to be considered a true value investment?” Graham considers buying when the market price is considerably lower than the intrinsic or real value, a minimum of 40 to 50 percent below. The enterprise value is used because I think it is a much more accurate measure of the company’s true market value than market capitalization. The margin of safety evaluation shows that there was the margin of safety for TCCO at 80 percent average against the intrinsic value. MOS was very high in 2010 at 99 percent, while intrinsic value goes up at a rate of 2850 percent, same period. EPS is the company’s last 12-month earnings per share; G: the company’s long-term (five years) sustainable growth estimate; 9: the constant represents the appropriate P-E ratio for a no-growth company as proposed by Graham (Graham proposed an 8.5, but we changed it to 9); and 2: the average yield of high-grade corporate bonds. As we have mentioned earlier, that intrinsic value is the real value or the true value of the stock. EPS factors net income and the number of shares outstanding. The net income of TCCO soared up too, by 700 percent from $1 to $8 million and resulting in $4.68 EPS. Now, let us see what factors sustainable growth rate. Please walk with me, let us see the table below for the calculation, let us dig a little more. The return on equity increased by 454 percent in 2010 because the net earnings soared up high too, obviously, we get a high result of sustainable growth rate, which resulted to a high annual growth rate and high intrinsic value. This is the reason why the margin of safety was high in 2010 for TCCO. I hope I have guided you well. There are two approaches to calculating the sustainable growth rate. By using the relative return on equity and the other one is by using the average return on equity. The table below will show you the difference between the two approaches. 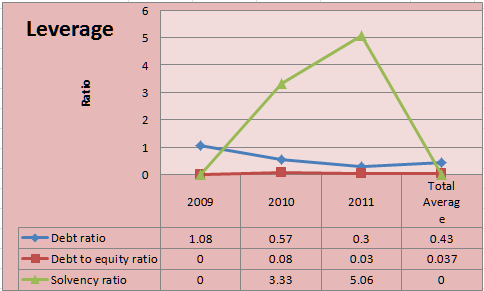 The table shows, using the relative return on equity produces a higher result for TCCO. Using the average ratio is taking into consideration the past period’s performance; the ROE was negative in 2006 at -$2.49, thus giving us a lower ratio in 2007. Therefore the result was lower in using the average approach. Look I saw a graph below and here goes again my questioning side as what the graph means. I would like to explain to you further the relationship between the intrinsic value or the true value of the stock and the price. The graph below will make us fully understand the meaning of margin of safety. Please walk with me. The enterprise value, as to what Cris’s said, was constant at an average of 6, while the intrinsic value has an erratic figure or movement. In 2010, the true value of the stock of TCCO soared up very high as a percentage of 2850 percent. The space between the IV line (red line) and the EV line (blue line) is the margin of safety. As we can see the MOS was very high at a percentage of 99 percent, but during the trailing twelve months, there were zero margins of safety because the intrinsic value was lower than the price. This is how we get the margin of safety for TCCO. The relative valuation methods for valuing a stock are to compare the market values of the stock with the fundamentals (earnings, book value, growth multiples, cash flow, and other metrics) of the stock. The price to earning*earning per share (P/E*EPS) valuation tells us that the stocks were trading at the undervalued price from 2007 to ttm6, because the enterprise value per share was lower than the result of P/E*EPS, therefore the price was cheap. The enterprise value per share was $2.92 average, while the P/E*EPS was $4.48 average, telling us that price was lower than the result of the valuation. There is another approach in calculating this valuation, and that is by using the average price to earnings ratio rather than the relative ratio. I have made a comparison between the two approaches. Using the average approach produces a higher percentage of P/E*EPS, this means that the price is more undervalued than by using the relative approach. The use of this ratio is, to separate price and earnings in the enterprise value. By dividing the enterprise value to projected earnings (EPS), the result represents the price (P/E) and the difference represents the earnings (EPS). In EV/EPS, the price was -341 percent, while the earnings the EPS was 441 percent, net of 100 percent. The percentage of price was negative because the EPS during the trailing twelve months was negative, there were no net earnings during this period and EPS factors net income. The EV/EBITDA indicates that it will take 1 time or 1 year to cover the costs of buying TCCO. The company had average net earnings of 16.51 percent and EBIT of 19 percent. It shows that the company is capable of generating sufficient revenue for its business operation. With its sustainable growth rate of 20.27, the annual growth rate of $49.55. Moreover, a return on equity of $21.41 average, shows a favorable sign of TCCO’s strength. The market value of the TCCO was erratic in movement. The company is a no-debt-equity ratio of zero, cash and cash equivalent was 103 percent of the enterprise value. Buying the entire business of TCCO is buying 100 percent of its equity. The current market capitalization to date, October 16, 2012, was $10.5 million at $5.85 per share. Buying to date will cost $6.5 million at $3.25 per share. Graham stock test indicates stock was trading at an overvalued price. Because the price was over 66 percent of the NCAVPS. The stock was trading above the liquidation value of the company. Therefore it did not pass the stock test of Benjamin Graham. While in MV/NCAV the price was overvalued because the ratio exceeds the 1.2 ratios. On the other hand, the margin of safety indicates an average of 80 percent of the intrinsic value. Further, the intrinsic value soared up high at 2850 percent in 2010 in one year. The income soared up high at 700 percent in 2010. The sustainable growth rate was $20, while the annual growth rate was $50. In addition, the return on equity was $21, a favorable growth for TCCO. Furthermore, in the P/E*EPS was undervalued because the price was lesser than the P/E*EPS result. Using the average price to earning approach, the P/E*EPS percentage was higher by 3 percent. While the EV/EPS valuation shows that the price was -341 percent and the earnings was 441 percent. It shows a negative result for the price to earnings because the earnings in ttm6 were zero. Moreover, the EV/EBITDA indicates that an investor will wait one year to cover the costs of buying the entire business. This shows that TCCO is capable of generating sufficient revenue for its business operation. TCCO shows a favorable growth and a margin of safety of averaging 80 percent. However, the current margin of safety was zero, I, therefore, recommend a HOLD in the stock of the TCCO. Is Tencent Holdings Ltd Had Sufficient Fund to Expand? The balance sheet is where we can determine how many resources they have their liabilities. Is Tencent Holdings Ltd liable or had sufficient fund to expand? Financial liquidity is to measure a company’s strength over its short-term obligation. We used the current ratio to measure management efficiency to pay its current debt over their current resources, meaning current assets over current liabilities. The quick ratio can serve as the basis on how quickly the management pays its current debt. This can be calculated using the total current asset less inventory over current liabilities. Net working capital was a result of total working capital over total assets. Tencent financial liquidity is very liquid and efficient. Based on TTM, it resulted that they had twice available cash both from their current obligation using current and quick ratio. It means that in ever $1 of debt it had an equivalent amount available of $2.50. Net working is high at 40 percent in TTM or in every dollar of the asset they have a return of $.40. Leverage is used to measure the ability of the business to meet its long-term debt obligations; through debt ratio, debt-equity, and solvency. The debt ratio is the results of total liabilities over total assets; while debt equity is from total liabilities over equity. Solvency was from a total of income including depreciation over total liabilities. Tencent Holdings Ltd’s leverage was highly indebted to equity holders at 68 percent and to creditors for up to 41 percent. They were solvent at 126 percent, meaning an available of income of 1.26 over their $1 of debt. The majority shareholder, according to Dyne, is calculated in order to determine who majority holder of the company was. It can be through using current liabilities over total assets, wherein we can know if it is hold by current debtors. Long-term liabilities over total assets if it is in favor of bank or bond companies; and equity over total assets will be from stockholders. For Tencent, the company was strongly dominated by its shareholders at 60 percent followed by creditors at 33 percent and by banks or bond holders at 7 percent. Asset management measures a company’s efficiency in handling its resources. It can be viewed from receivable, payable and fixed asset turnover also inventory but I did not consider here in ten cents because only from 2007 to 2008 has a minimum of inventory. Receivable turnover can be calculated using total sales over receivable over the period; payable turnover is a result of sales over accounts payable; whereas fixed asset turnover is a result of total revenue over the net of PPE for the period. Tencent was very efficient in managing wherein the result per total average turnover of receivable was 10, payable was 21 and fixed asset was 5. It tells us that in every $1 of sale, a company had an average turnover from receivable at 10 times, in payable at 21 times and in the fixed asset at five times. It was very efficient. Cash conversion cycle measures the length of time. It was expressed in days, that it takes for a company to convert resource inputs into cash flows. It can be evaluated using the inventory conversion period plus receivable conversion period less payable conversion period. The result based on average, Ten cents is very quick in converting their sales into hard cash, it was -22 days; it means the management can use it first prior to paying their obligation. Property, plant, and equipment or simply PPE is a company asset to business operations but cannot be easily liquidated. The value of PPE is typically depreciated over the estimated life of the asset because even the longest-term assets become obsolete or useless after a period of time. Having a look at the above table, Tencent Holdings Ltd had a yearly investment in a fixed asset in five years which grew by 25 percent average. After deducting its accumulated depreciation, the net book value had a life span for a maximum of four years. The income statement is where we can determine if the company is profitable or not. It was a statement of their sales, expenses, and profit. Now, the question that will keep running in our minds is “Is the income of Tencent Holdings Ltd sufficient to cover its cost? Worry no more because we will surely get the answer in the following topics presented to us by Dyne. Profitability ratios measure the results of business operations or overall performance and effectiveness of the firm. These are expressed as a percentage. Among these are net margins in which the net income will be divided into net sales. Asset turnover was the result of net income on total assets; return on assets; was the result of net income over total asset for the period; return on equity using DuPont was the combined result of net profit margin multiplied to asset turnover ratio and multiply by equity multiplier or financial structure ratio. The financial structure was based on the result of assets over stockholders equity and tax effect ratio based on net profit result over income before tax (PBT). Tencent profitability per TTM is profitable and sustainable. A slight swing from net margin but TTM was closed to 31 percent or $.31 of every 1 of sales. The company had a high asset turnover at 140 percent or $1.4 in every $1 of the asset. Return on equity (ROE) and Return on asset (ROA) were moderate at 75 and 44 percent, meaning in every $1 of equity and asset it had a payback of $.75 and .44 percent, respectively. The financial structure is very solid at 168 percent and even after tax it had a high return of 83 percent. Revenue is the main stream of the company. Gross profit was a result of revenue less cost of revenue. Operating income, in addition, is the result of gross profit less operating expenses. Income before tax is operating income less or adds other sources of income and expenses. The net income is the bottom line or the result after all the expenses were applied. Tencent Holdings Ltd revenue grew consistently with a minimum of 30 percent per year. Based on the graph you can see the growth at a rapid pace from revenue down to net income. Meaning, management efficiency is very effective and aggressive. Expenses, from the word itself, are all about cost and expenses incurred within the period. The cost of revenue is cost directly associated with sales whereas operating expenses are expenses that are related to the operation like salaries, advertising, and marketing expenses. As revenue grows there would be a possible growth of expenses. Just like the income, the graph is ascending for the expenses. According to Dyne, based on the total expenses, the company had a minimum increase of 25 percent. At per TTM it showed higher expenses in cost of revenue represented at 55 percent, operating expenses was 35 percent and 10 percent for taxes. Margins measure a company’s growth within the period. It can be seen through different margins. Among these are gross profit margin (gross profit over revenue); operating margin (operating income over revenue); EBIT is the result of EBIT over revenue, and net margin is the result of net income over revenue. Overall, it leads you to how much percentage of profit does a company after $1 sale. Tencent margin result was high but declining, with an average of 2 percent. But it had a remarkable high of return that per TTM, with every $1 of sale, it had a return gross profit of $.62, operating return of .37 and EBIT of .38 and net margin of .31. This means that the management has a sufficient fund for the next rolling year. Cash flow is a statement where you can determine how much cash is coming in or out within a particular period. It is classified per activities which run from operating, investing up to financing. Having said that, Tencent cash flow summary revealed that they had an increasing inflow of cash from operating which was opposite from investing an increasing outflow of cash and an outflow based on TTM in financing. Therefore, per TTM net change in cash still resulted in the inflow of cash, since cash from operating was more than its company outflow by 16 percent. Cash flow from operating was cash used or provided for the operation. It can be determined using the income method or reconciliation method. It differs from the user of data which income method basically begin from the net income result and add back all the non-cash operating while in reconciliation method it will use the result of total collection less total cash paid within the period. The total collection is the net result of net sales less account receivable and total cash paid are like cash payment made in purchases, operating expenses, interest, and taxes. Tencent Holdings Ltd showed that they had strong management in the collection. It had rapid growth and per TTM net cash collected was equivalent to 48 percent, cash payments made was 52 percent. It means that in every $1 of sale they have available cash of $.48 which was very high. Cash flow from investing is activities of cash were the company put their money. In particular was an acquisition of fixed asset like PPE, intangibles and other investment like stock or bonds. Tencent is a holding investment company which the classification of the industry itself, we could expect that their investment is possibly moving. The result of net cash flow from investing was highly increasing and the main sources were coming from the purchase of investment represents 76 percent average from the NCFI. Cash flow from financing is flows of cash were the company used or provide. Among are from stockholders, bank or bondholder and also if the company paid a dividend. Tencent net cash flow in financing resulted in 65 percent equivalent of cash inflow from debt issued in 2011. On the other hand, common stock repurchased had an increase of 68 percent in 2011 and also a continued dividend paid which trending upward but in 2009 marked at 56 percent paid increased. The free cash flow is a metric wherein you can determine if the company has a sustainable fund after applying their expenditure. Tencent graph of free cash flow was very impressive due to the high result in operating but a minimal increase of CAPEX expenditure. This is the reason why Tencent is focused on the purchase of an investment. We are now down to the last topic of this report…the cash flow efficiency or CFE. What basically is this CFE all about? Cash flow efficiency is variation metrics using the result of cash flow from operating over sales, current debt, CAPEX and total debt of the company. The graph below showed the results for Tencent Holdings Ltd.
Tencent cash flow was very effective and efficient. Per TTM, they can generate cash from the sales an equivalent of 47 percent, available cash from the operation of 198 percent. An average free of cash at 89 percent, very high return from CAPEX at 1073 percent or 10 times back to investors and free from debt either short term or long term debt at 164 and 198 percent respectively. Presented next to this statement are the results for Kingstone Companies Inc.
For KINS, the enterprise value and market value was generally increasing from its 5 years of operation and was trending at 42 and 130 percent average, respectively. The total debt represents 10 percent and cash and cash equivalent were 4 percent, thus enterprise value was higher by 6 percent than in market value. Buying the entire business of Kingstone Companies Inc., an investor will be paying 94 percent of equity and 6 percent of total debt in the total amount of $18 million at $4.5 per share for ttm9. This is the price that an investor is willing to pay. The buying price to date, October 13, 2012, was $19.9 million at $4.98. The stock price of KINS in ttm9 increased by 20 and 36 percent for the enterprise value and market value, respectively. Benjamin Graham’s net current asset value (NCAV) method is well known in the value investing community. Studies have all shown that the net current asset value (NCAV) method of selecting stocks has outperformed the market significantly. According to Graham when a stock is trading below the net current asset value per share, they are essentially trading below the company’s liquidation value and therefore, the stocks is trading in the bargain, and it is worth buying. The concept of this method is to identify stocks trading at a discount to the company’s net current asset value per share, specifically two-thirds or 66 percent of net current asset value. Now we know the NCAV method, so basically, what is the result after applying this to Kingstone Companies Inc? The result of, NCAV valuation, based on the above table, tells us that in 2007, 2008, 2011 and ttm 9, the stock of KINS was trading at an overvalued price. This is because the market value was greater than 66 percent of NCAVPS, therefore, it did not pass the stock test. While in 2009 and 2010, the stock price was undervalued, because the market price was lesser than 66 percent of NCAVPS, thus, it passes the stock test. The net current asset value in 2007 and 2008 was negative because total liabilities were greater than the total assets. The stock of KINS was trading above the liquidation value in 2007, 208, 2011 and the TTM, while in 2009 and 2010, the stock was trading below the liquidation value. Therefore, the stocks did not pass the stock test of Benjamin Graham. Another stock test by Graham is by using market capitalization and dividing it to net current asset value (NCAV). If the result does not exceed the ratio of 1.2, then the stock passes the test for buying. So, let us see if the stock of KINS passes the stock test. 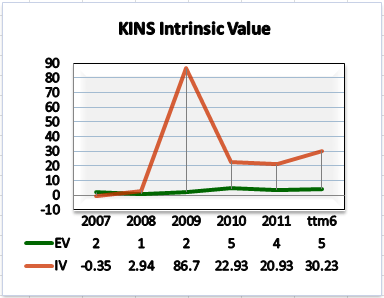 The table above indicates that the MV/NCAV valuation for KINS shows that the stock traded as overvalued in 2007 and 2008 because the ratio was more than 1.2. While, in 2009 for the trailing twelve months, the stock was trading undervalued because the ratio was less than 1.2. This formula is used to identify the difference between company value and price. Value investing is based on the assumption that two values are attached to all companies – the market price and the company’s business value or true value. Graham called it the intrinsic value. The difference between the two values is called the margin of safety. Value investing is buying with a sufficient margin of safety. But the question is, “How large of the margin of safety is needed for a stock to be considered a true value investment?” Graham considers buying when the market price is considerably lower than the intrinsic or real value, a minimum of 40 to 50 percent below. 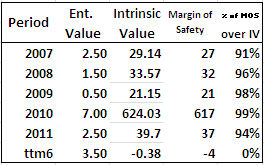 The margin of safety valuation tells us that there was a margin of safety for KINS at an average of 60 percent. MOS was high in 2009 at 97 percent. Now, let us see how the intrinsic value was calculated. Please walk with me. EPS, the company’s last 12-month earnings per share. G: the company’s long- term (five years) sustainable growth estimate. 2: the average yield of high-grade corporate bonds. The intrinsic value was erratic in movement and it was very high in 2009. It factors the sustainable growth rate and earning per share. 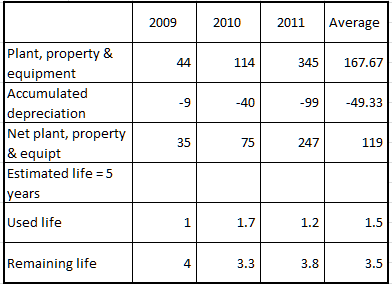 The table showed that the annual growth rate was very high in 2009 due to high sustainable growth rate. SGR shows how fast a company can grow using internally generated assets without issuing additional debt or equity. The return on equity was 14.79 average for KINS. During 2007 and 2008, the return on equity was negative. There was a payout ratio in 2011 and the ttm9. The sustainable growth rate was 14 percent average. There are two approaches in calculating the sustainable growth rate, one is factoring the relative return on equity and the other one is by using the average return on equity. The annual growth rate and intrinsic value is affected. Let us see the table below for its differences. 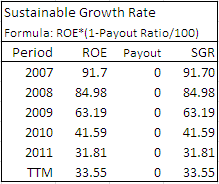 As we can see, the result of using the average return on equity produces lesser results for growth and intrinsic value, while the margin of safety has a greater percentage using the average ROE. The margin of safety was 50 and 68 percent for relative and average ratio, respectively. To make us fully understand the real value of the stock or the intrinsic value in the relationship with the margin of safety the graph will help us. The enterprise value (green line) is constant at an average $3, while the intrinsic value (orange line, was erratic in movement. It shows that in 2009, the line goes up further high at $87, meaning the stock of KINS traded at a discount; and by the following period, 2010 it dropped very low at -96 percent, although there was a remaining margin of safety at 78 percent. 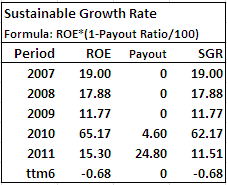 For intrinsic value, I used the average ROE approach, because it has a favorable result. Moreover, the space between the two lines, intrinsic value, and the enterprise value represent the margin of safety. In 2007, there were zero margins of safety for KINS because the IV line was lower than the EV line. Figuring the space in between the two lines for 5 years, we get an average of 68 percent. This is the safety we get in buying the stocks of KINS, meaning the price was 68 percent below the true value of the stock, Furthermore, it means selling at a discount. The relative valuation methods for valuing a stock, are to compare market values of the stock with the fundamentals (earnings, book value, growth multiples, cash flow, and other metrics) of the stock. The stocks were selling at an overvalued price during the periods of 2007, 2009 and 2010. While, in 2008, 2011 and 2012 stocks were undervalued, because the enterprise value was below P/E*EPS. In other words, the price was cheap. In the relative approach, the percentage of P/E*EPS was higher than by using the average approach. The EV/EPS valuation the price was -$69 or -381 percent and the earnings was $88 or 481 percent average. The price resulted in negative because the net earnings of KINS were lesser than its number of outstanding. There were no net earnings for KINS in 2007 and negative earnings in 2008. The enterprise value consists of earnings, this is the price that an investor is willing to pay. The result for EV/EBITDA valuation shows an average of 3 times or 3 years. Buying the entire business of KINS, an investor will wait 3 years to cover the cost of buying. In other words, buying the entire business will take 3 periods of earnings to cover the cost. The enterprise value and the market value was increasing in general at 42 and 130 percent average, respectively. Total debt was 10 percent of the enterprise value, while cash and cash equivalent were 4 percent of the EV. Thus making EV higher by 6 percent than in market value. Buying price to date, October 13, 2012, was $19.9 at $4.98 per share. Furthermore, the stocks were trading at an overvalued price because the price was above the liquidation value. Therefore, indicating that the price was expensive. In the MV/NCAV valuation, the stock was undervalued because it did not exceed 1.2 ratios. The margin of safety was averaging 60 percent using the relative return on equity. On the other hand, using the average ROE the margin of safety was 68 percent. There is potential for buying. In P/E*EPS valuation, the price was undervalued in 2011 and in 2012. The percent of P/E*EPS was 105 and 77 percent using the relative and the average price to earnings, respectively. Moreover, in EV/EPS price (P/E) was -381 percent, while the earnings (EPS) was 481 percent, net of 100 percent. The percentage was high because there were zero earnings for 2007 and negative earnings in 2008. While the succeeding years shows that the net earnings were lower than the number of shares. The investors will have to wait for 3 years to cover the cost of buying. In other words, it will take 3 times the earnings to cover the cost of purchasing. To sum it up, the stock price of Kingstone Companies Inc. was trading at fair value. There was a margin of safety at averaging 68 percent. Further, the company started paying dividends since 2011. Therefore, I recommend a BUY in the stocks of KINS. This is the first area of the financial statement. To further understand, we will begin to look into their liquidity, efficiency, and strength. The current ratio is the result of dividing current assets by current liabilities. The trend of first three years increased with a growth ratio of 83 percent, and 74, with a latest quarter current ratio of 2.24 times. Likewise with a quick ratio or the result after dividing quick asset (current asset minus inventory) over current liabilities showed the same trend as a current ratio with the latest quarter of 2.07 times. Their net working capital ratio depicted a favorable growth of 45 percent and 54, an increasing trend with an average of 28 percent. This was computed by working capital over the total asset. Their current ratio and quick ratio depicts that they are financially healthy with its current resources having enough funds to settle obligations and creditors. But their net working capital ratio which starts a dip down -0.05 percent in 2009, increases 35 and 54 percent in 2010 and 2011 respectively. This means they have a favorable and sufficient working capital for operations. Efficiency ratios measure how effectively the company utilizes their assets to generate revenues, as well as how well it manages its receivables and liabilities. The receivable turnover ratio is the number of times accounts receivable collected throughout the year. This showed a downward growth trend of 19.2 percent and 22.8 with trailing twelve months of 11.67 times. The payable turnover ratio shows investors how many times per period the company pays its average payable amount. There was an increasing growth trend of 142 percent and 33 with trailing twelve months of 7.72 times for ZNGA. And fixed-asset turnover ratio measures a company’s ability to generate net sales from fixed-asset investments – specifically property, plant and equipment (PP&E) – net of depreciation. Wherein for 2010, ZNGA increased by 212 percent and had a decrease of 34.8 in 2011 with trailing twelve months of 3.79 times. Asset turnover ratio is a number of sales generated for every dollar’s worth of assets. This showed an up and down trend with trailing twelve months of 60 percent. This means a lower and unstable amount of sales generated for every dollar of total assets. Zynga Inc had managed well their receivables at an average of 13.75 times and their TTM of 11.67. This means that receivables collected turn to cash monthly. While payable s were being paid with an average of 5.85 times and TTM 7.72 times. This tells us that they are paying their creditors or obligations favorably within two months compared in 2009. They don’t have any inventory for a service company. And regarding, its fixed asset turnover ratio and asset turnover ratio, it has been unstable for the last three years meaning lesser utilization of fixed assets. Receivable conversion period measures the number of days it takes a company to collect its credit accounts from its customers. There was an upward trend of 23.7 percent and 29.6 with trailing twelve months of 31.3 days for ZNGA. While payable conversion period measures how ZNGA pays its suppliers in relation to the sales volume being transacted. This showed a favorable decreasing trend of 58.8 percent and 24.9 with TTM of 47.3. Cash conversion cycle validates the effectiveness of the company’s resources in generating cash. Which shows a good decreasing trend of 73.9 percent and 72.6 with TTM of 16.0. Therefore, cash conversion cycle was favorable for Zynga Inc. They managed well their conversion cycle for receivables having an average of 26.5 days to be converted to cash with TTM of 31. Their payable has a term average of 79.4 days to pay their obligations to suppliers wherein TTM show a much shorter term of only 47.3 days. This means that they do have a favorable payment term with their suppliers. Total average cash conversion cycle of 51.8 days or TTM of 16 days validates the effectiveness of the company’s resources in generating cash. Zynga Inc manages their debt ratio well, meaning their total asset was more than their total liabilities. And they have low debt-to-equity ratios indicating that the company is not taking advantage of the increased profits that financial leverage may bring. Thus, with lesser long term liabilities, solvency ratios show their financial soundness in meeting their obligations. Debt ratio indicates what proportion of debt a company has relative to its assets. This showed a declining trend of 47.2 percent and 47.3 with a total average of three years of 43. Debt to equity ratio is a measure of the relationship between the capital contributed by creditors and the capital contributed by shareholders. This showed that they don’t have any long term debt in 2009 and minimal other long term debt in 2010 and 2011 or 8 and 3 percent respectively. Solvency ratio determines how well the company is able to meet its debts as well as obligations, both long-term and short-term. But in ZNGA, they had less other long term debt with no short term liabilities, therefore they were very solvent at 333 percent and 506 in 2010 and 2011, respectively. Current liabilities to total assets identifies how much will be claimed by the creditor against total assets. This show a decreasing growth trend of -49 percent and -42, with an average of 55. While another long term debt to total assets is to make out how much claim has the banks or the bond holder against its total assets. This show that they don’t have any long term debt in 2009 only in 2010 and 2011 of 3 and 2 respectively, with an average of 1.7 percent. Then, stockholders equity to total assets is to know how much the owner can claim in its total assets. This shows a negative amount of 8 in 2009 and increases to 43 and 70 percent with an average of 35 percent. Therefore, majority control of the ZYNGA INC based on total asset was claimed by their creditors of averaging to 55 percent and 35 percent of a total asset was by their stockholders. And 1.7 percent of total asset had been claimed by their bond holders and banks. Gross plant, property, and equipment is the gross total of fixed assets cost, which show an increasing growth trend of 159 percent, and 202 with an average cost of 167.67. Accumulated depreciation is to reduce the carrying value of an assets to reflect the loss of value due to wear, tear and usage. Likewise in an increasing trend with an average of 49.33 million dollars or 29 percent of the gross PPE. The net plant, property, and equipment is the result after deducting the accumulated depreciation from gross PPE, this shows an increasing growth trend of 114 percent and 229. And it has an average of 119 million dollars or 71 percent of gross PPE. Therefore, based on the above data, the remaining book value of the PPE has an average of 71 percent, using the percentage method of depreciation, this means it has 3.5 useful years remaining. The second financial statement we need to review is the income statement of Zynga Inc. This allows a business as well as investors, to understand if the company is operating efficiently, successfully, gaining or losing. Their net margins which simply is the after tax profit a company generated for each dollar of sales. Wherein this showed an up and down trend with growth ratios of -7100 and -133 percent with -42 percent trailing twelve months. Their asset turnover which measures the effectiveness of the company to convert its assets into revenues. This reflected a likewise up and down trend with growth ratios 85 and -27 percent with trailing twelve months of 60 percent. The return on assets tells us how much profit the company generated for each dollar of total assets. This depicted negative returns in 2009 and 2011 as well, and only in 2010, it has a favorable return of 13 percent. Their return on equity is how much ZYNGA could return such profit percent for every dollar of equity. This showed that the company had a low return on equity of 30 and 31 percent in 2010 and 2011 respectively with trailing twelve months of -36 percent. The company’s financial leverage measures the financial structure ratio based on total assets against total stockholders equity. They had an equity multiplier of 2.30 in 2010 and 1.44 in 2011 with trailing twelve months of 1.46. Zynga’s net margin was unfavorable in 2009 and 2011 because of the net loss incurred during the said period. Its asset turnover ratio tends to be inversely related to their net margin, wherein they had a lower net margin and higher asset turnover. The investors can compare companies using this to determine which one is a more attractive business. And this means they earned more from converting assets to revenue than revenue itself. Their return on assets depicts unsatisfactory earnings for every dollar of total assets due to their net loss and total assets growth ratio yearly was on an upward trend. But they had a good return on assets in 2010. DuPont Model is an equity multiplier used to measure the financial leverage allowing investors to see what portion of the return on equity is the result of debt. In terms of Zynga Inc’s return on equity using this model, it was abruptly high at 230 and 144 percent in 2010 and 2011. While return on equity based on profit margin and sales showed only 30 and 31 percent meaning the bulk of the return comes from the debt portion of the equity. Their revenue means how much money they havegeneratedin terms of sales, representing the amount of money a company brings in for selling its goods and services. In this case the ZYNGA’s revenue was upward with growth ratios of 393 and 90 percent with trailing twelve months of 1,272 million dollars. Gross profit shows how much of their markup they received on the goods and services it sells after deducting its cost of revenue. Likewise, this showed an increasing trend with growth ratios of 548 and 92 percent with 354 million dollars trailing twelve months. Operating profit is the best indicator of a company’s true performance in their operations. This is the result after deducting all the expenses incurred in their operations. This showed that the ZYNGA INC have negative amounts of -53 and -406 in 2009 and 2011 while in 2010 a favorable earnings of 125 million dollars. Net income is what’s left over for a company after all expenses have been accounted for. This depicted an up and down trend with growth ratios of -1500 and -343 percent with trailing twelve months of -531 million dollars for ZYNGA. The company showed a good revenue and gross profit the past three years but due to their increasing operating expenses in research and manpower cost their operating profit and net income resulted in a loss in 2009 and 2011. Cost of revenue was the amount ZYNGA paid for the goods that was sold during the year. This showed an increasing growth trend ratios of 209 and 87.5 percent with trailing twelve months of 918 million dollars. This showed an average against revenue of 30 percent. Operating expense was the expenses incurred in conducting their regular operations of the business. Wherein it had an increasing growth trend ratio of 151 and 311 percent. And it had an average against revenue of 87 percent. Other income and expense was the non operating income and expenses from their business. This showed 2 in 2010 and a -1 in 2011. Provision for income tax was the amount allocated for their payment of income taxes. And this reflected a 36 million dollars in 2010 and a -2 in 2011. This has an average of 1.8 percent against revenue. Cost of revenue is a direct cost to help in the distribution and marketing of their services as a provider of social gaming. The result on this was abruptly increasing . While its 2011 operating expenses reflected a double increase of 311 percent from 2010 which was to high with an average of 87 percent. This means that expenses with reseach and development in their operations soar unexpectedly causing a big gap in cost so as their total expenses abruptly increase. ZYNGA INC was definitely investing to expand in their operational business as accounted for the increase in research and expanding manpower cost. ZYNGA’s margins measures the total performance of their business operations for the past three years. Wherein gross margin has an average of 65 percent which show a good profit margin of at least more than 50 percent. But they have unfavorable operating margin of -19.34, EBT margin of -19.27 and net margin of -23.33 percent. This means it was below our scaling standards therefore gauging their performance in 2009 and 2011 were both unimpressive. Their gross margin indicates the percentage of revenue dollars available for expenses and profit after the cost of merchandise is deducted from revenues. The results showed an increasing trend with growth ratios of 32.3 and 0.74 percent with a three year average of 65. And their operating margin is the operating income expressed as a percentage of sales or revenue after deducting the operating expenses from gross profit. This has an up and down trend with a favorable ratio of 21 percent in 2010 and negative ratios in 2009 and 2011 with trailing twelve months of 24 percent. While net margin is the net income expressed as a percentage of sales or revenue after deducting provision for income tax from income before tax. It only had a good operations in 2010 that reflected a 15.24 percent of net margin. While both 2009 and 2011 and TTM depicted negative ratios of -43.48, -35.62 and -41.75 percent respectively. The third financial statement of Zynga Inc is their cash flow statement. This help us determine if they have an available cash for the operation, how much was used and provided in investing or financing or if they have a good free cash flow and excess of funds to refinance operations for business expansion. As shown in table above, Zynga Inc had an unimpressive net income, a decrease trend in 2009 of -53 million dollars then favorably increase to 91 in 2010, but abruptly decline to -404 in 2011 with trailing twelve months of -531. Their depreciation and amortization had an increasing growth trend of 290 percent and 143 with TTM of 123. It has an amortization of debt discount in 2010 and 2011 of 2 and 3 respectively with TTM of 8. It has investment gain in 2011 of 1 and same trailing twelve months of 1. 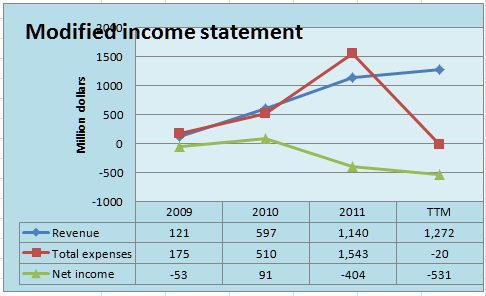 Deferred income taxes of -8 in 2010 was due to negative net income in 2009 and a 4 in 2011. Their stock based compensation was quite alarming that it showed a growth trend of 500 percent and 2400 with trailing twelve months of 782 million dollars. Its accounts receivable and payable had an increasing trend with TTM of -9 and -26. It has other working capital with an up and down trend and trailing twelve months of only 20. And other non cash items of -37 in 2010 and a 14 in 2011 with TTM of -9. So, the company had a favorable net cash provided by operation in an increasing trend of 70.6 percent and 19.3 with TTM of 357 million dollars. ZYNGA INC had sufficient cash flow provided from operating activities and it seems to be increasing yearly. This show us that they had a good earning operations despite that their net income was unimpressive in 2009 and 2011. And as noted they have a high increases in their stock based compensation from 24 million dollars in 2010 to 600 in 2011. This means compensation to employees and directors was paid in stocks, thus also increasing their additional paid in capital in 2011. Their investments in plant, property & equipment of ZYNGA INC, as shown in table below, depicted an increasing amounts of -39, -57 and -238 with trailing twelve months of -425 million dollars. They had net of acquisition of -1, -62 and -43 with TTM of -217. They had purchases of investments in an up and down trend amounting -125, -805 and -650 with TTM of -1,397. They also had sale/maturities of investments with growth ratio of 422 percent and 166 with TTM of 607 million dollars. Its purchases of intangibles showed -1 in 2009 and 2010 and -4 in 2011 with trailing twelve months of -3. 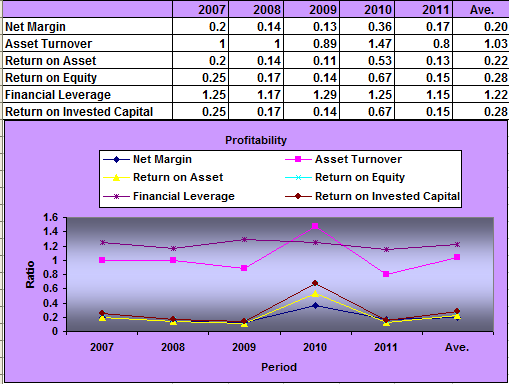 With other investing activities of -1, -17 and 8 in 2009 to 2011 with TTM of 24. Therefore, net cash used in investing activities have an up and down trend yearly of -103, -617 and -63 in 2009 to 2011 with TTM of -1,411. Net cash used for investing activities was used in investments in property which increases from 75 million dollars in 2010 to 247 in 2011. This means they heavily invested abruptly in 2011 in plant, property and equipment. And they also have purchases of investments, purchases of intangibles and other investing activities. This means ZYNGA INCused funds wisely into their investing activities. So as, it has cash flow from investing as provided by the sale/maturities of investments. In reference of the table below, you can see that the company had cash flow from financing by issuance of preferred stock of 14, 305, and 485 or a growth ratio of 2079 percent and 59 with warrant issued in 2010 of 5 million dollars. While issuance of common stock in 2011 of 961 with common stock repurchases in 2010 and 2011. They had an excess tax benefit from stock based compensation of 40 and – 14 in 2010 and 2011 with TTM of -14. And other financing activities of 3 and -80 with TTM of 971 million dollars. Thus, net cash provided by financing results fairly with 14, 351 and 1,069 or growth ratio of 2407 percent and 204.5 with trailing twelve months of 955 million dollars. ZYNGA INC was favorably finance by their issuance of stocks preferred and common, in fact they used their stock to compensate their employees and directors. This is to increase their stockholder’s equity by increasing their additional paid up capital. And only 30 percent of the issued common stock was repurchased. This graph is to picture the relationship of the following: cash flow from operation, investments and financing activities as well as the net change in cash. Zynga Inc overall showed that for the three years operations they have a net change in cash amounting 102, 60 and 1,395 million dollars in 2009 to 2011 respectively. This is the total results of cash flow from operations, investing and financing activities, with an up and down trend and growth ratio of -41 and 2225 percent and TTM of -99 million dollars. To check the company’s net change in cash, the beginning cash of 26, 127 and 188, will be deducted from the their cash at the end amounting 127, 188, and 1,582. The result showed that they have an increasing trend in cash with ending balance of 1,582 million dollars in 2011. Thus, telling us that their net change in cash in 2009 was 102, in 2010 it decrease to 60 due to the increase in purchases of investments but it has greatly improve in 2011 to 1,395 million dollars due to the issuance of common stocks. To get if the company have free cash flow to be used in operations and expansions, we deduct their capital expenditures from operating cash flow amount resulting to free cash flow. The result showed that ZYNGA INC have sufficient free cash flow but in a up and down trend yearly with growth ratio of 76.3 percent and -45 with trailing twelve months of -71 million dollars. This tell us that capital expenditure abruptly increase in 2011 causing free cash flow to decrease. Operating cash flow to sales ratio measures how much cash generated from its revenue for the period and gives investors an idea of the company’s ability to turn sales into cash. Herein it started well with 158 percent and declining down to 55 and 34 from 2009 to 2011 with TTM of 28, or approximately 1.58, 55 and 34 cents of operating cash flow in every sales dollar. Therefore, the greater the amount of operating cash flow the better. The past three years reflected an inconsistent and unfavorable investment qualities due to the decreasing trend of its ratio for ZYNGA INC.
Operating cash flow ratio measures how much cash left after considering short debt by using the result of operating cash flow from operations over current liabilities. This show a good liquidity in terms of using cash flow as opposed to income which is sometimes a better gauge. In this case ZYNGA INC had a sufficient operating cash flow to cover up its current obligations of 81 percent, 63 and 58 from 2009 to 2011, but trend yearly was decreasing. They needed to increase operating cash flow to have a good and favorable company’s liquidity in the short term. Free cash ratio help us conclude if the company will grow in the future. Through the result from operating cash flow less dividend paid less capital expenditure over operating cash flow. This show that the company have free cash flow in an up and down trend. During 2009 and 2010 it has a high and beneficial relationship of 80 and 82 percent respectively. However, in 2011 it abruptly goes down to only 38 percent and as the single most important financial metric used to measure the investment quality this reflect unfavorable to the company for the larger the number/ratio the better. And trailing twelve months depicted an unimpressive -20 percent. Capital expenditure ratio measures company sustainability in maintaining their assetsby using the result of operating cash flow over capital expenditure for the period. ZYNGA INC showed an up and down trend which was inconsistent for the past three years. In 2009 and 2010 it has a high and increasing cash flow to capital expenditure ratio of 489 and 562 percent indicating a financial flexibility to invest in itself. But in 2011 it declined down to 161 percent due to the increase in capital expenditures. This means they invested in their plant, property & equipment making upgrades to its buildings, machinery, and processes. Total debt ratio measures company efficiency, the result of operating cash flow over total liabilities. It showed a 68, 52 and 51 percent from 2009 to 2011 respectively which reflected a favorable decreasing trend. This mean that their debt ratio of less than 1 indicates thatZYNGA INC had more assets than debt. Therefore, in conjunction with other measures of financial health, the debt ratio can help investors determine a company’s level of risk. Current coverage ratio measures how much cash available after paying all its current debt. It is determine through cash flow from operating less dividend over current liabilities. This depicted an inconsistent decreasing trend ratios of 81, 63 and 58 percent from 2009 to 2011 respectively on ZYNGA INC’s and this showed a lesser percent of debt the company’s current cash flow can retire or repay. Therefore, a good cash debt coverage ratio of 1:1 (100%) or greater shows that the company can repay all debt within one year. Excel Maritime Carriers Ltd (NYSE: EXM), owner and operator of dry bulk carriers and a provider of worldwide seaborne transportation services for dry bulk cargoes, such as iron ore, coal, and grains, as well as bauxite, fertilizers and steel products. Excel owns a fleet of 40 vessels, among which one Capesize vessel is through a majority joint venture and, together with seven Panamax vessels under bareboat charters, operates 47 vessels (7 Capesize, 14 Kamsarmax, 21 Panamax, 2 Supramax and 3 Handymax vessels) with a total carrying capacity of about 4.1 million DWT. We are able to know how the formula. So what will be the results for Excel Maritime Carriers Ltd? The table next to this will show the historical enterprise value for EXM. Let us find out how the market value and the enterprise value is trending from its 5 years of operation. The enterprise value was greater than the market capitalization by 72 percent due to 79 percent total debt, while its cash and cash equivalent represented only 2 percent of the enterprise value. The market capitalization was 28 percent of the enterprise value. This means that total debt (net of cash and cash equivalent) of 72 percent was added to the market capitalization and that summed up to enterprise value. Remember, owning the business is also taking part in the total debt of the company as enterprise value factors debt and cash. The movement of market capitalization was erratic from 2007 to ttm3 but in general, the market value of EXM was deteriorating, same as with the enterprise value. The total number of shares of EXM increased by 67 million in less than 5 years. Moreover, the market price dropped by 98 percent in its 5 years of operation. The market value of Excel Maritime Carriers Ltd dropped at a rate of 26 percent average. EXM was high leverage because its total debt, short-term, and long-term debt was 79 percent of the enterprise value. The company might be at risk of bankruptcy if they are unable to pay their debts on time. To compute the net current asset value, we subtract the total liabilities from the current assets. Then, we convert the NCAV to a per-share figure by dividing the number of shares outstanding. 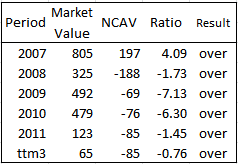 Finally, compare the per-share NCAV to the recent stock price. The stock passes if the current share price is no more than 66 percent of the NCAV. The net current asset value method tells us that the stock was traded above the liquidation value of EXM. This means that the price traded at an overvalued price, therefore, it did not pass the stock test. The stock of Excel Maritime Carrier Ltd was overvalued and expensive for 2007 to the trailing twelve months (3). With this valuation, the stock cannot be a candidate for buy. The result above was only a part. Let us see and consider also if the result of the other valuation would still be the same for the first one. By calculating market capitalization over the net current asset value of the company, we will know if the stocks are trading over or undervalued. The result should be less than 1.2 ratios. Graham will only buy if the ratio does not exceed 1.2 ratios. The result of MV/NCAV valuation shows that the stock of EXM was overvalued because the result was more than 1.2 ratio. The stock price was trading at an overvalued price from 2007 to ttm3 meaning the price was expensive. The stock did not pass the Benjamin Graham stock test, therefore not a candidate for buying using this stock test. The basic meaning of “Margin of Safety” is that investors should only purchase security when it is available at a discount to its underlying intrinsic value – what the business would be worth if it were sold today. There are some guidelines as to how to calculate “Intrinsic Value”. The key point for investors to remember is that they should only invest in a company when its stock is trading below what the firm would sell for in the open market. Those investors who ignore valuation concerns and overpay for their investments are operating with zero margins of safety. Even if their underlying companies do well, these investors can still get burned, according to one follower of Benjamin Graham. 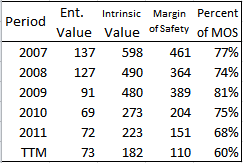 For EXM, there was the margin of safety from 2007 to ttm6 except in 2008. The average margin of safety was 68 percent, where there was a zero margin of safety. The margin of safety was high in 2009 at 92 percent. The intrinsic value was erratic in the movement from 2007 to ttm3. According to her, EPS is the company’s last 12-month earnings per share; G is the company’s long-term (five years) sustainable growth estimate; 9 is the constant represents the appropriate P-E ratio for a no-growth company as proposed by Graham (Graham proposed an 8.5, but we changed it to 9); 2 is the average yield of high-grade corporate bonds. The table above showed how the intrinsic value was calculated. The earning per share, sustainable growth rate, and the annual growth rate were negative during 2008, 2011 and the trailing twelve months. The reason for this is that the net earnings of EXM during these periods were negative at 6, 59 and 90 percent, respectively, thus the growth was also negative. 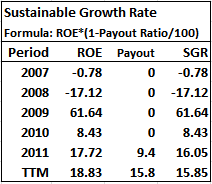 The intrinsic value was erratic in the movement because it factors earnings per share and the sustainable growth rate. Now, let us move on with the calculation of sustainable growth rate (SGR). The factor used in the calculation of SGR was the return on equity (ROE). 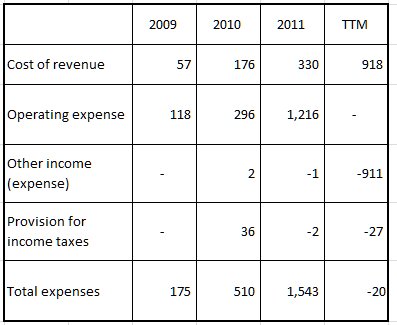 As we can see in the table above the ROE was also negative during the same periods – 2008, 2011 and the ttm3 because of its negative net earnings. There was no payout ratio during 2008 to ttm3, thus the SGR was the same as the ROE. SGR is the main factor in getting at the intrinsic value and the intrinsic value is the main factor in arriving at the margin of safety. There is another way of calculating the fundamentals in the above calculations. I used the relative return on equity and the other one is the average return on equity. 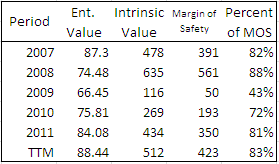 As you can see, the result of using the average return on equity in the calculation of SGR produces a higher margin of safety than by using the relative ratio. Using the average, we are considering the previous growth of the company. The intrinsic value is the true value of the stock and the price is the value of the stock in the market. The graph shows, that in 2008, the intrinsic value line was below the enterprise value line. Meaning there was no margin of safety and the stock of EXM was trading above the true value of the stock. 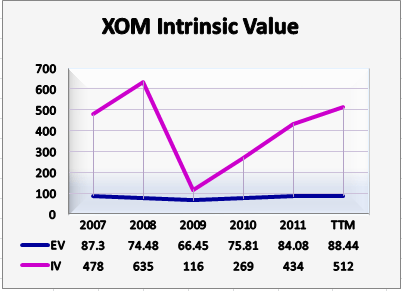 While in 2007, 2009, 2010, 2011 and ttm3, the intrinsic value line was far above the enterprise value line, meaning there was the margin of safety and the stock of EXM was trading below its real value. If you are investing, this is one way to see how safe is your investment be. All the valuation above is not enough to gauge Excel Maritime Carriers Ltd. The following relative valuation method will guide us further in gauging EXM. The Price to Earning – Earning Per Share (P/E*EPS) valuation is used to divide a company’s enterprise value per share by its projected earnings per share. The concept is to determine whether stocks are under or overvalued. Weaknesses in using this valuation are, Price to Earnings (P/E) ratio fluctuate considerably and volatile, making it a difficult indicator to read over short periods of time. Longer term is more accurate in determining whether a company is over or undervalued. The result must be compared to Enterprise Value per share. If enterprise value is lesser than the result, the stocks are undervalued, if the enterprise value per share is greater than the result, it means that the stocks are overvalued. Price to Earnings (P/E) Ratio indicates the multiple that an investor is willing to pay for a dollar of a company’s earning. It shows the number of times that a stock price is trading relative to its earnings, the stock price fluctuates, so this ratio. While Earning per Share (EPS) serves as an indicator of a company’s profitability. In price to earnings*earning per share (P/E*EPS) valuation, the table shows that the stock of Excel Maritime Carriers Ltd traded at an overvalued price from 2007 to ttm3 2012. This means, that the share price was expensive because the enterprise value was greater than the result of P/E*EPS valuation. Let me point out that in this valuation, I have used the enterprise value to compare the result and not the market price. I think this is more appropriate because EXM has a huge total debt which represents 79 percent of the enterprise value, as enterprise value factors total debt. If an investor is buying, this is the price he is willing to pay. The price to earnings represents a 10 percent average, while the enterprise value represents a 27 percent average. This means the price was expensive. I have made a comparison in this valuation by using the relative and average price to earnings. The average price to earnings ratio has a higher result than by using the relative ratio in calculating this valuation. While the percentage of P/E*EPS is lower in an average ratio by 50 percent. The use of this ratio is it separates the enterprise value per share by its projected earnings per share (EPS). By dividing enterprise value per share to earning per share, the result represents the price (P/E) and the difference represents the earnings (EPS). This separates the price to earnings ratio and the earning per share. The result was the price (P/E) and subtracting the result to enterprise value we get the earnings (EPS). So enterprise value per share was divided into two ratios the P/E, and the EPS. This will show you how much of the trading price was the earnings and how much of the price. This is the price you are willing to pay. For EXM, the total earnings represented 115 percent average, while the price was -15 percent average of the enterprise value. Enterprise Value (EV)/Earnings Before Interest, Tax, Depreciation and Amortization (EBITDA) or (EV/EBITDA). This metric is used in estimating business valuation. It compares the value of the company inclusive of debt and other liabilities to the actual cash earnings exclusive of non-cash expenses. It is useful for analyzing and comparing profitability between companies and industries. This metric gives us an idea of how long it would take the earnings of the company to pay off the price of buying the entire business, including debt. Enterprise value is the computed value of the company by adding total debt to market capitalization and deducting the cash and cash equivalent and short-term investment. EBITDA is net income with interest, taxes, depreciation, and amortization. The result represents the number of times or years an investor would recover its purchase price or costs. In Totem a maximum of 2 years or 2 times is enough to wait to cover the cost of buying, more than 2 years is a long period of waiting. For EXM, I have adjusted the EBITDA to $17.7 according to the internal report published by EXM for ttm3. The average EV/EBITDA result was -179 times or -179 years. What does this mean? EXM was not profitable, there were a long number of years to cover the costs of buying the whole business, meaning the earnings was unpredictable. For three consecutive periods, the company suffered losses in a high percentage. It indicates that EXM was not efficient in operating the business and in generating revenue sufficient for their daily operational activities. The company’s earnings are really down and unstable, with the result of EV/EBITDA valuation. Investing in the stock of EXM is very unpredictable. The market value of Excel Maritime Carriers Ltd dropped by 98 percent in less than 5 years. Total debt was 79 percent and its cash and cash equivalent was only 2 percent. The enterprise value was higher by 72 percent of the market value due to its debt. EXM is highly leveraged but might be at risk of bankruptcy if its obligations were not properly managed. Moreover, the stock of EXM did not pass the test because the stock traded above the liquidation value of EXM. While the MV/NCAV valuation tells us that the price was overvalued because the result exceeded the 1.2 ratios. On the other hand, there was the margin of safety at an average of 68 percent using the relative return on equity in calculating the sustainable growth rate. While using the average ROE shows a 78 percent margin of safety. This is more than the 40-50 percent below intrinsic value. The stock of EXM was overvalued in the P/E*EPS valuation. While the EV/EPS valuation tells us that the price (P/E) was -15 percent and the earnings (EPS) was 115 percent. This is the price an investor is willing to pay in considering buying. Further, the EV/EBITDA valuation indicates the unprofitability of EXM, with the result of -179 times or -179 years. This means, there was no definite period to cover the cost of buying the whole enterprise. The earnings of the company are unstable. This is a very unfavorable result for EXM. The management is not efficient in generating sufficient revenue for the daily operational activities. There was a margin of safety at an average of 68 percent. The stock traded at an overvalued price. In other words, the price was expensive. A HOLD position is recommended for the stock of Excel Maritime Carrier Ltd (EXM). How Efficient Groupon Inc (GRPN) is? This value investing guide is the star of our report, the Groupon Inc (GRPN) Rio, part of our Numbers team, made this analysis to walk us through the financial health of the company. Liquidity refers to how quickly and cheaply an asset can be converted into cash. Money (in the form of cash) is the most liquid asset. To know how liquid the company is, we used ratios. current ratio, quick ratio, and working capital. For Groupon Inc. results from 2009 to June 2012, Rio gave us the results below. Current ratio in percentage was 1.4, .47, 1.33 and 1.27. For the three years period and as of June 2012, the current asset was greater than current liabilities except in the year 2010 where its ratio was only 47 percent, however, it recovered in 2011. Quick ratio was the same as its current ratio since the company has no inventory account. Working capital in dollars was 4,-196, 328 and 301. As noted in the above table, it was positive $4 in 2009, dropped to -196 in 2010 but recovered in 2011 by having a positive balance of 328 and $301 as of June 2012, which shows that it’s improving. Out of the past 3 years’ performance of Groupon Inc., the year 2010 was not good as its current resources was smaller than its current obligations with a ratio of 47 percent and the working capital was a negative balance. However, its performance in 2011 started to improve at 133 percent. Efficiency ratios are used to measure the quality of the company’s receivables and how efficiently it uses its other assets. Receivable turnover ratio was 15, 17 and 15. This is the number of times its receivable turns over a period of time. Receivables turnover is a ratio that works hand in hand with average collection period to give the business owner a complete picture of the state of the accounts receivable. Payable turnover ratio was 12 and 39. This is the number of times the company pays its obligation each period. This ratio measures how the company pays its suppliers in relation to the sales volume being transacted. A low percentage would indicate a healthy ratio with all bills be paid in a timely manner. Fixed asset turnover ratio was 45 and 31. This tells us that the company has generated $0.45 and $0.31 of sales for every $1 of fixed asset. The fixed asset turnover ratio looks at how efficiently the company uses its fixed assets, like plant and equipment, to generate sales. If you can’t use your fixed assets to generate sales, you are losing money because you have those fixed assets. Total asset turnover ratio was 1, 1.87 and .91. The total asset turnover ratio shows how efficiently your assets, in total, generate sales. The higher the total asset turnover ratio, the better and the more efficiently you use your asset base to generate your sales. In the past three years of operation, the company has fairly utilized its resources in generating income to continue to run its business operation. The debt ratio compares a company’s total debt to its total assets, which is used to gain a general idea as to the amount of leverage being used by a company. A low percentage means that the company is less dependent on leverage, i.e., money borrowed from and/or owed to others. Debt ratio was 3, .98, .60 and .61. The company’s obligations were high in 2009 but have managed to lower it down in 2010 and succeeding periods. Debt to equity was -1.50, 46.63, 1.52 and 1.55. It was negative in 2009, extremely high in 2010 at 46.63 but able to lower it down in 2011 and 1st half of 2012. Solvency ratio was -.02, -1.01, -.23 and -.01. The company has a negative chance of paying off its obligations in case of bankruptcy. The company is insolvent. 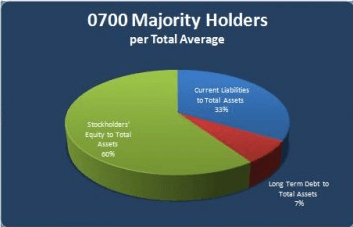 Current liabilities to total asset ratio was .67, .97, .56 and .55 as of first half of 2012, this means that the creditors have 55 percent in control of Groupon Inc. assets. Stockholders’ equity to total assets ratio was -2, .02, .40 and .39 which tells us that the owners have only 39 percent claims on the total asset of the company. Therefore, the creditors have the majority claims on the company’s total asset of 55 percent. The foregoing analysis further shows that Groupon Inc. total obligations were 61 percent of total assets and 155 percent of owners’ equity while its solvency ratio was negative, which means no chance of paying off its total debt in case of bankruptcy. Gross PPE was 18, 66 and 111 which shows that the company was expanding yearly with a growth of 267 percent and 68 percent respectively. Its accumulated depreciation was 2, 15 and 28 which is equivalent to 11 percent, 23 percent and 25 percent of the total cost. Net PPE was 16, 51 and 83. Based on the above table, if we assigned 5 years as the estimated life of the fixed asset, the remaining life would then be 3.7 years as of June 2012. Therefore, the property is still usable for 3.7 years before it is fully depreciated. Net margin was -.07, -.59 and -.16. It showed a consistent negative balance in three years period. Return on asset was -.07, -1.10, -.14 . This tells us how much profit the company generated for each dollar of total assets. The company showed a negative result. Return on equity was .03, -52.50, -.36. It reveals the percentage of profit after income taxes that the corporation earned on its average common stockholders’ balances during the year. Financial leverage was -.50, 47.75 and 2.52, this measures the financial structure ratio of the company base on total assets against total stockholders equity. Return on invested capital was -.20, -32.50 and -.36, the financial measure that quantifies how well a company generates cash flow relative to the capital it has invested in its business. Revenue was 15, 713 and 1610 which showed a yearly growth of 4653 percent and 126 percent respectively. This tells us that its business was doing good as far as its revenue is concerned. Gross profit was 10, 280, 1352 with a yearly growth of 2700 percent and 383 percent respectively and it is doing good as well. This is the result after deducting the cost of revenue from total revenue. Operating income was -1, -420 and -233. The company incurred a consistent net loss due to high selling, general and administrative expenses. Income before tax was -1, -420 and -254. Income after tax was -1, -390 and -279. Based on the above table, the company showed an impressive performance in generating revenues for the three years of operation. Its gross profit showed an increasing growth every year. However, after deducting the related expenses on selling, general and administrative, it resulted in a net loss in its three years of operation. Therefore, the company needs review and proper control of its expenses to continue operation of its business. The cost of revenue was 5, 433 and 259. This is equivalent to 33, 61 and 16 percent of the total revenue. Selling/general/administrative expense was 11, 497 and 1589 which showed that it is greater than the cost of revenue. It even bloated by 4418 percent and 220 percent in 2010 and 2011 respectively. Income tax was 0, -7 and 44. On the foregoing analysis of Groupon Inc., we noted that the ratio of the selling, general and administrative expenses to sales were 73, 70 and 99 percent which was very much higher than its cost of revenue of only 33, 61 and 16 percent respectively. Therefore, the company incurred a net loss. Gross margin was .67, .39, .84. an average of .63. This is the percentage of gross profit to total revenue. As shown above, the company’s gross margin is within its normal level. Operating margin was -.07, -.59, -.14 average of -.27. This is the percentage of operating income to total revenue. Since the operating income incurred a negative balance, so its margin also incurred a negative percentage. Net margin was -.07, -.55, -.17, average of -.26. As shown in the above table, Groupon Inc. gross margin was high at 67 percent in 2009, went down to 39 percent in 2010 but recovered in 2011 to 84 percent. However, the operating expenses of the company were too high which resulted in a negative balance of the operating income and net margin. So the company needs to be managed well, to give focus on the operating expenses since these are controllable in nature. They have to determine which are necessary to the operations and which are not. As per above data, the company’s revenue was increasing every year with lower cost, however, its expenses were not controlled resulting in a net loss in three years period. The company has to implement proper control of its expenses without sacrificing sales. The cash flow statement is one of the three most important financial statement a business owner uses in cash flow analysis. The concept of cash flow is different from the concept of profit or net income and the business owner should think of each in different terms and analyze each from different perspectives. Shown below is the cash flow of Groupon Inc.
Net income was -1, -413 and -298 with ttm of -44. In three years period of operation, the company incurred a negative net income. Depreciation and amortization were 0, 13 and 32 with ttm of 41. Accrued liabilities was 5, 95 and 189 with ttm of 177. Other working capital was 4, 147 and 362 with ttm of 187. Net cash provided by operating activities was 8, 87 and 290. with ttm of 393. It shows that after adjustments made on the cash inflows and outflows of the business transactions related to its operation the company has still remaining cash to continue run its business. Net cash provided by operating activities of Groupon Inc. showed a positive balance with a growth of 987 percent and 233 percent respectively, although its net income was consistently negative in three years period. This is due to the adjustments made which involved depreciation and amortization, accrued liabilities and other working capital. Investment cash flows are cash received from the sale of long-life assets or spent on capital expenditure (investments, acquisitions, and long-life assets). Shown below is the cash flow from investing activities of Groupon Inc. from 2009 to 2011. Investment in PPE was 0, -15 and -44 with ttm of -62. The company deferred its investment in 2009 and started in 2010 and expanded in 2011 by 193 percent. The company made an acquisition of an asset in 2010 of $4 and -57 in 2011. Its purchase of investment was -32 in 2011 while the company purchase of intangibles was -1 and -15 in 2010 and 2011 respectively. However, the company’s other investing activities was -1 in 2009. So, its net cash used for investing activities was -2, -12 and -147 with ttm of -185. It showed a negative balance since these are cash outflow transactions. Groupon Inc. has expanded its business through investments on PPE, intangibles and other investing activities which resulted in negative net cash used for investing activities. Based on the above table, total cash inflows was $1896 which is consist of debt issued $5 in 2010; common stock issued $30,585 and 1266 and excess tax benefit $10. Total cash outflows was $994 which are debt repayment -14, preferred stock repaid -55, -35; common stock repurchased $-503, -354; dividend paid $-26 and -1 and other financing activities $-6 in 2011. Net cash provided by financing activities was $4, 30 and 867. On the company’s financing activities, its net cash had a positive balance of $4, 30 and 867.This is due to its issuance of common stock in 2009 to 2011 where they got funds to pay a dividend as well as repurchase common stock and repayment of preferred stocks. Free cash flow was 7, 71 and 232 with trailing twelve months of 316. Its growth in 2010 versus 2009 was 914 percent and 227 percent in 2011. It tells us that the company has funds available to retire additional debts, increase dividends or invest a new line of business. Operating cash flow to sales was .53, .12 and .18. This is the comparison of the operating cash flow versus total revenue of the company. It measures how well a company’s daily operations can transform sales of their products and services into cash. Operating cash flow ratio was .80, .24 and .29. This tells us how much cash flow can cover the short term obligation of the company. Free cash flow ratio was .88, .82 and .80. Free cash flow is the money left after deducting capital expenditure and shown here that it has still funds available to retire additional debts, increase dividends and invest another line of business. Capital expenditure ratio was 0, 5.44 and 5.58. This is the percentage of operating cash flow against CapEx. In 2010 and 2011 the ratio was 5 times high which means the company has the ability to acquire assets using its free cash flow. Total debt ratio was .18, .23 and .27. The ratio of the company’s operating cash flow against total liabilities was increasing per period, however, it is not sufficient to settle the company’s total liabilities. Based on the above analysis, Groupon Inc. operating cash flow and free cash flow showed a positive balance and consistently increasing per period, however, it is not sufficient to pay off its total obligations. Is Arden Group Inc still a Buy? Arden Group Inc (ARDNA) focuses on the larger US real estate markets with positive demand factors and then invests in high-quality properties with untapped value while utilizing our operating skills and creativity in seeking to achieve superior returns for our investors. Arden Group is a privately held, vertically-integrated real estate fund manager, investor, and operator that owns and finances properties across the United States. Since our founding in 1989. This model was made in a simple and easy way to value a company for business valuation. The basis in this valuation is the company’s five-year historical financial records. I calculated first the enterprise value as my first step in valuation. I also applied the relative valuation method by using Price to Earnings (P/E), Earning per Share (EPS), Enterprise Value (EV) and Earning Before Interest + Tax + Depreciation + Amortization (EBITDA). The concept of enterprise value is to calculate how much it would cost to purchase an entire business. Enterprise value (EV) factors liabilities and cash. In other words, enterprise value measures the value of the productive assets that are used in producing its product or services. The market capitalization is the entire value of the company in the stock exchange. It represents the price of the equity. The total debt represents the sum of short term and long term debt. Cash and cash equivalents include short-term investment. The table below will show the historical enterprise value for Arden Group Inc. Let us find out how the market value and the enterprise value is trending from its 5 years of operation. The market capital represents an average of $334, while the enterprise value is was $284 average in 5 years. Total debt was 0.30 percent average and cash and cash equivalent was 15 percent average of the enterprise value. The enterprise value was lesser due to its cash and cash equivalent which was higher than the total debt of the company. The number of shares outstanding was constant at 3 billion yearly for 5 years. The value of ARDNA was falling from 2007 to 2010 but by 2011, it started to rise up by 6 percent. In the event that an investor would be buying the entire business of ARDNA, they would be paying 100 percent of its equity because the total debt of ARDNA was absorbed by its cash and cash equivalent. The buying price to date, October 1, 2012, was $240.7 at $80 per share. Net Current Asset Value (NCAV) method is well known in the value investing community. Studies have all shown that the net current asset value (NCAV) method of selecting stocks has outperformed the market significantly. It is looking for firms trading so cheap that there was little danger of falling further. This strategy calls for selling when a firm’s share price trades up to its net current asset value. The reason for this is when a stock is trading below the net current asset value per share, they are essentially trading below the company’s liquidation value and therefore, the stocks are trading in a bargain, and it is worth buying. The result of the calculation for the net current asset value method indicates that the stock of Arden Group Inc. was trading at an overvalued price from 2007 to 2012 ttm6. In other words, the price was trading above the liquidation value of ARDNA, therefore, the stock did not pass the stock test because the price was expensive. Another stock test is by using market capitalization and dividing it into net current asset value (NCAV). If the result does not exceed the ratio of 1.2, then the stock passes the test for buying. So, let us see if the Arden Group Inc. pass the stock test. The table showed that the stock of ARDNA did not pass the stock test because the ratios were more than the 1.2 ratios. Therefore, it tells us that the price was expensive from 2007 to 2012 ttm6. The MV/NCAV valuation tells us also that the stock was trading at an overvalued price. The Margin of Safety requires knowing when the buying price is low in absolute terms, rather than merely relative to the market as a whole. This formula is used to identify the difference between company value and price. Value investing is based on the assumption that two values are attached to all companies – the market price and the company’s business value or true value. We called it the intrinsic value. The difference between the two values is called the margin of safety. Value investing is buying with a sufficient margin of safety. The question is “How large is the margin safety needed for a stock to be considered a true value investment? We consider buying when the market price is considerably lower than the intrinsic or real value which is a minimum of 40 to 50 percent below. In my calculation, I used enterprise value because it takes into account the balance sheet so it is a more accurate measure of the company’s true market value than market capitalization. The table shows that the margin of safety for ARDNA was high at 72 percent average. It was high in 2009 at 81 percent average. The intrinsic value of the stocks of the company was higher than the enterprise value per share. This indicated that the stock was trading below the true value of the stocks. Using the margin of safety valuation, the stock price of ARDNA is considered cheap because it was trading below the true value of the stock. Therefore, it can be a candidate for buying. EPS: the company’s last 12-month earnings per share. 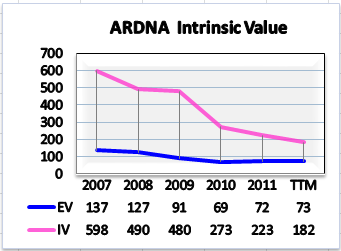 As we can see from the table, the intrinsic value of ARDNA was deteriorating from 2007 to 2012 ttm6. This is because of the sustainable growth rate and the annual growth rate decreased. Sustainable growth rate shows how fast a company can grow using internally generated assets without issuing additional debt or equity. The table below for the sustainable growth rate showed that the return on equity decreased by almost 50 percent from 2007 to 2012 ttm6. The payout ratio of Arden Group Inc. increased from 2007 to 2012 ttm6 by nearly 100 percent. This showed that the company is paying its cash dividends to its shareholders yearly. The growth for ARDNA was high during 2009 at 30.58, the average for sustainable growth rate was 22.25. Now, we all know how those terms differ from each other. I will show you the relationship between price and the true value of the stock of ARDNA. The graph below will help us understand fully its relationship. The intrinsic value (IV) showed that it is much higher than the enterprise value (EV). This indicated that the price traded below the true value of the stock. The difference between the intrinsic value line and enterprise value line was 72 percent average, and this is called the margin of safety. The intrinsic value showed a favorable result because the trend was constant at 70 percent in five years. In 2012 ttm6 the margin of safety was 60 percent. By using the average return on equity in calculating the growth it produces a higher result. The margin of safety represents 77 percent in average ratio while using relative ratio the margin of safety was only 72 percent. And the growth was higher by using the average ratio. This valuation will determine whether the stocks are undervalued or overvalued by multiplying the Price to Earnings (P/E) ratio with the company’s relative Earning per Share (EPS) and comparing it to the enterprise value per share. With this, we can determine the status of the stock price. The result of the P/E*EPS valuation tells us that the stock of ARDNA traded at an undervalued price since the enterprise value per share was lower than the result of P/E*EPS from 2007 to 2012 ttm6. The enterprise value represented $95 average while the P/E*EPS had an average of $108. Therefore the price was undervalued. 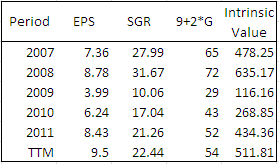 Using the relative and average price to earnings ratio in calculating P/E*EPS valuation shows that it produces almost the same result for ARDNA. The use of this ratio is its separate price and earnings from the enterprise value. By dividing the enterprise value to projected earnings (EPS), the result represents the price (P/E) and the difference represents the earnings (EPS). In this valuation, the price was 15 percent and the earnings represent 85 percent. Therefore, the stock of ARDNA was trading at an undervalued price. Because the price represents only nearly one-fifth of the trading price. The trading price for the stock of ARDNA is undervalued, therefore, the price was cheap. The result of the EV/EBITDA valuation was 7 times average. Meaning, buying the entire business of ARDNA, an investor will wait 7 years to cover the costs of buying. In other words, it will take 7 times the earnings of ARDNA to cover the purchase price. EBITDA was constant but deteriorating at an average of 6 percent. The value of Arden Group Inc. in the market is decreasing at an average of 10 percent. The cash and cash equivalent were greater than the total debt by 15 percent average. The net current asset value valuation approach tells us that the stock of ARDNA did not pass the Benjamin Graham stock test. Because the stock was trading above the liquidation value of the company. Another stock test using the net current asset value indicates that the price was expensive because the ratio exceeds the 1.2 ratios, therefore, it did not pass the stock test. Using the margin of safety, it tells us that the margin of safety was 72 percent average. There was a margin of safety from 2007 to 2012 ttm6. By using the average return on equity in calculating the sustainable growth rate, the margin of safety was higher by 5 percent or 77 percent. 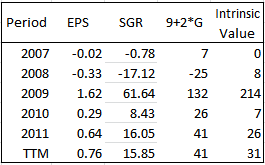 On the other hand, relative valuation method in P/E*EPS valuation shows that the stock of ARDNA traded at an undervalued price. While the EV/EPS indicates that the price was 15 percent and the earnings were 85 percent of the enterprise value. Therefore, the price is undervalued. Moreover, using the EV/EBITDA valuation, showed a result of 7 times or 7 years for an investor to cover the costs of buying the entire business of ARDNA. In other words, it will take 7 times for the earnings of ARDNA to cover the costs of buying. It indicates that the stock price of ARDNA was undervalued. The margin of safety exceeds the requirement of 40-50 percent above the trading price. Therefore, the stock was trading below the true value of the stock at 77 percent using the average return on equity for growth. Graham would take the opportunity to buy if a margin of safety was at least 40 percent. Therefore, I recommend a BUY in the stock of Arden Group Inc (ARDNA).